BEND, OR -- With six months still to go before the election, the fight for Deschutes County Sheriff is already getting heated. Deputy Eric Kozowski has cited recent internal investigations as evidence of Sheriff Shane Nelson’s lack of leadership, but Nelson tells KBND News his challenger is speaking out of turn. "That goes back to a lack of management experience, and the fact he’s talking about things he does not know all of the facts. And, that can be a slippery slope because that can create liability for an office." He adds, "It’s very inappropriate to talk about ongoing investigations." But, Kozowski says he has extensive experience running a private business and managing several programs during his time with the Wallowa County Sheriff’s Office, including the Marine Patrol. He tells KBND News he spent time "working to get additional funding to expand the program; managing the budget; hiring personnel and managing personnel, those kinds of things." He says, "I also rebuilt the Reserve program from the ground up, there. Then, of course, hiring personnel and managing them, as well; taking them through a training process – creating a new training process that didn’t exist, and then taking personnel through that training process." Kozowski was a Wallowa County deputy for six years before coming to Deschutes County in 2010. "You were responsible for everything as a [Wallowa County] deputy. We didn’t have a Detective Division; we didn’t have Street Crimes. We did have a regional drug task force, but it was a small one. So, yeah, you were responsible for everything, from start to finish, there." Current Wallowa County Sheriff Steve Rogers did not return KBND's request for comment on Kazowski's work at the agency. SALEM, OR -- Many Oregon cities continue to struggle with a severe shortage of affordable housing. Lawmakers took up the issue again, during last week's Legislative Days, in Salem. Economist Josh Lerner, with the Oregon Office of Economic Analysis, tole lawmakers with more people wanting to move to key areas of the state, the region can't keep up. "Urban Oregon - Bend, in particular; Portland is obviously getting the most press in terms of the affordability crunch - have good economies and a very high quality of life. And, as such, we're victims of our own success and the price of housing gets bid up, particularly when we're supply constrained and do not have enough supply on the overall market. So, your affordability erodes because the demand is so high to live in a place that's a great place to live and has a good economy." And, he says urban growth boundaries complicate matters. "When we're looking at the problem of 'where can we build?' The answer is 'not in as many places.' And, to further complicate things, if the density isn't allowed by zoning, by right, in those areas, we can't add the density there. So, this is the trade-off as we start to look at what the market wants to do, versus the regulation." State lawmakers will meet again in September and December, to get ready for the next Legislative session which begins in January 2017. BEND, OR -- A prescribed burn is scheduled to begin at 9:30 Tuesday morning, on the western edge of Bend. Deschutes National Forest officials hope to burn 82 acres between Skyliner’s Road and Shevlin Park, in an effort to reduce wildfire fuels at the site of the future “Tree Farm” subdivision. No Forest Service or Shevlin Park lands are included in today's burn. Smoke will be highly visible in Bend, but officials say the burn will only commence if weather conditions are suitable to move smoke up and out of the area. Weather permitting, the burn will be completed by 2 p.m. However, officials suggest residents and businesses keep windows closed during the burn and overnight, to minimize smoke impacts. This is the first prescribed burn under a recent agreement between the Deschutes National Forest, The Tree Farm LLC and Bend Parks and Recreation to reduce fuels and improve forest health on both public and private lands west of Bend. 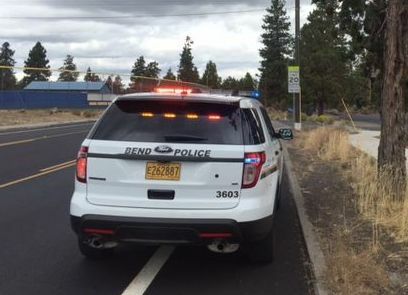 BEND, OR -- A portion of the Bend Parkway was closed for nearly an hour, Saturday afternoon, after a two-car crash just north of the Revere onramp. 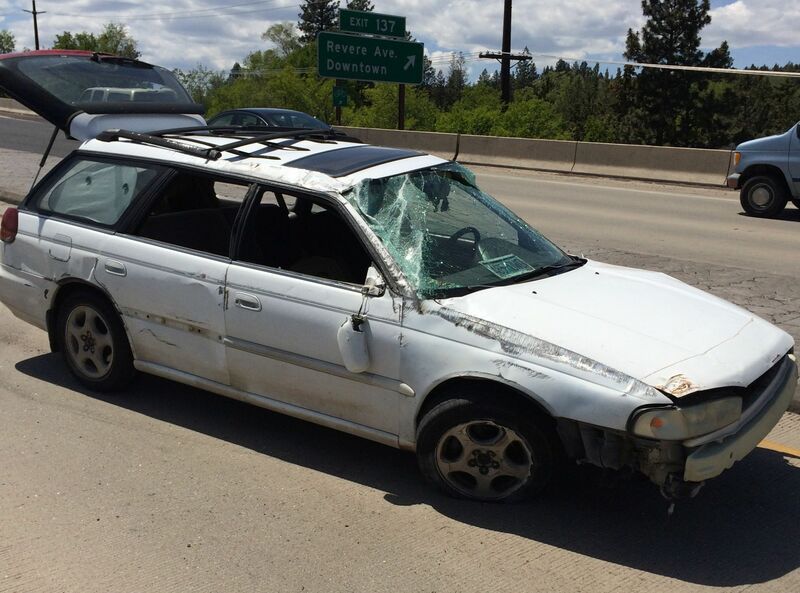 Police say Kyle Savage, of Bend, was speeding and using his cell phone when he drifted into the left lane and collided with an SUV. Savage lost control and rolled his car, which landed on its wheels. The SUV collided with a guard rail, causing major damage to both the vehicle and rail. Savage was cited for his part in that crash. REDMOND, OR -- A Redmond couple will stand trial on attempted murder and other charges, after a Deschutes County Grand Jury indicted the two 17-year-olds. Dakota Ortwein allegedly hid in his house until his mother came home, on May 19. Investigators say he sprayed her with pepper spray and hit her with a baseball bat. The woman was able to wrestle away the bat and call for help. The two were arrested last week. Prosecutors contend Ortwein and his girlfriend, Reyanne West, planned to kill his mother and burn down the Redmond house with her body inside. They were indited last week for Attempted Murder, Conspiracy to Commit Murder, Conspiracy to Commit Arson, Assault in the second degree and Unlawful Use of a Weapon. Ortwein and West are scheduled to appear on court June 10. 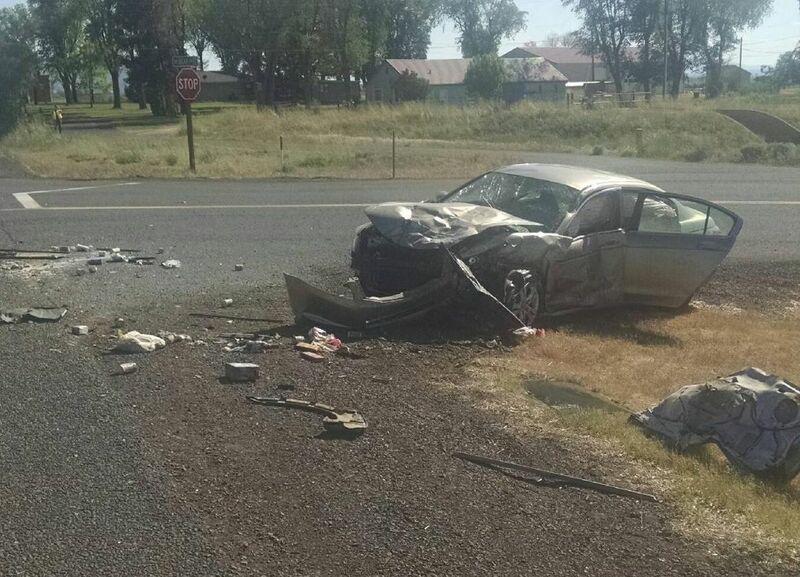 PRINEVILLE, OR -- A Prineville woman was hurt in a Friday evening crash, southeast of Prineville. Witnesses told Crook County deputies 80-year-old Janet Henderson may have become distracted by the two dogs in her car while driving on SE Juniper Canyon Road, just after 5 p.m. Henderson traveled nearly 300 feet on a gravel shoulder before over-correcting and traveling into the oncoming lane. Deputies say she over-corrected again, collided with an embankment and rolled her car onto its top. Airbags deployed and the dogs were unhurt; however, Henderson was trapped and had to be pulled out by Crook County Fire and Rescue. She was later taken to St. Charles Prineville with unspecified injuries. BEND, OR -- Two men face Robbery and other charges in connection with the Tuesday shooting at the Rodeway Inn, in southeast Bend. According to Bend Police, Justin Perkins (left) of Bend and Steven Premo (below) of California contacted two men staying at the motel. The suspects displayed a firearm and an electronic stun gun, and demanded property. During the altercation, the gun went off, although no one was hurt. Investigators believe another fight started as Premo and Perkins left the motel in a car. This time, Premo was stabbed multiple times and another man was shot in the leg. That victim was taken to the hospital with his non-life threatening gunshot wound. Several hours later, officers saw Premo and Perkins get into a cab; the two were taken into custody during a high-risk traffic stop near NE Neff and Purcell. Premo was then taken to the hospital and Perkins was lodged at the jail on a number of charges. On Friday, Premo was released from the hospital and arrested, as well. Investigators are still unclear on the relationship between the four people involved in the incident. 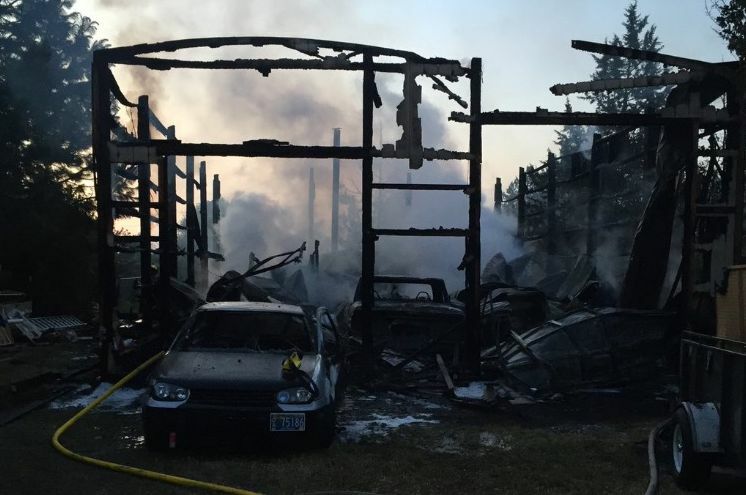 REDMOND, OR -- A Redmond shop was destroyed by fire, early Friday morning. A section of Southwest 27th remains closed, south of Antler, as fire crews mop-up. The blaze broke out at about 4 a.m. and firefighters say there were no injuries. No word yet on a cause for that fire. KBND News will update this story as more information becomes available. UPDATE: Firefighters responded to the Southwest 27th home just before 4 a.m., and were able to contain the fire and prevent it from spreading to nearby buildings. A family had recently purchased the property, who were in the process of moving into the house. Three people staying in the shop escaped the fire without injury, although their belongings were seriously damaged. REDMOND, OR -- Despite less than summer-like weather, Redmond’s Spray Park will open for the season, at 10 a.m., Friday. "I think kids are immune to the cold. I don’t think they care," says Redmond Parks Division Manager Annie McVay. She says last year, some complained the Centennial Parkwater feature didn’t open early enough. "It’s not as easy as flipping a switch. So, we just figured, 'we’re on schedule, we’ll go ahead and open it up.' I think Saturday or Sunday, if you come in the middle of the day, it might be warm enough." McVay tells KBND News this year, they’re trying something new. "The system actually has some really cool light features. But, since we close at 8, we never get a chance to see the lights along with the spray pad feature. So, we’re going to open up – we don’t have the dates finalized, yet – But, we’re going to do a couple nights this summer where we stay open late so you can take advantage of the light feature, as well." "If everything goes according to plan," she says, "We’ll be open everyday from 10 o’clock to 8 p.m. Sometimes we close if there’s lightning storms and that stuff, but otherwise it’s a pretty consistent program." Weather permitting, the popular water feature will remain open through Labor Day. BEND, OR -- Owners of a local cannabis company have said they want to be good neighbors. Thursday, OreGrown put those words to action. "Right on Wall Street, there was this abandoned triangle of land that nobody had noticed or done any work on for about seven or eight years. This is right across the street from our dispensary. 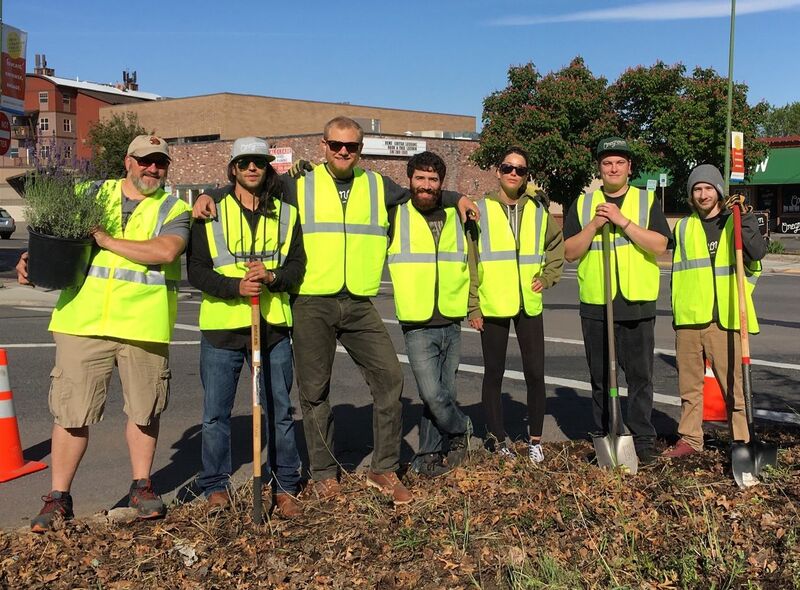 So, we approached the City of Bend, and the City of Bend worked with us to organize volunteers," Co-owner Aviv Hadar tells KBND News. He says when they started it was, "Really overgrown with weeds, cigarette butts and invasive species. And now, after we cleaned it up, it's so dramatic; such a dramatic difference." 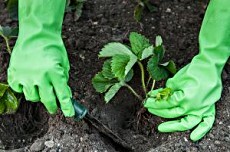 Hadar says a crew of eight OreGrown employees and three others cleaned out trash and weeds, laid bark and planted lavender on the small corner plot at Wall and Bond. The spot is a gateway into Downtown Bend on the north said, and Hadar says the Downtown Bend Business Association appreciates the effort. "Basically, we put together this project and called it a 'pocket park.' They're working on a plaque that says 'this area is maintained by Downtown Bend and OreGrown' that's going to be there permanently. And, we're going to be responsible for maintaining it, watering the lavender, cutting it back every year. It's going to smell beautiful." 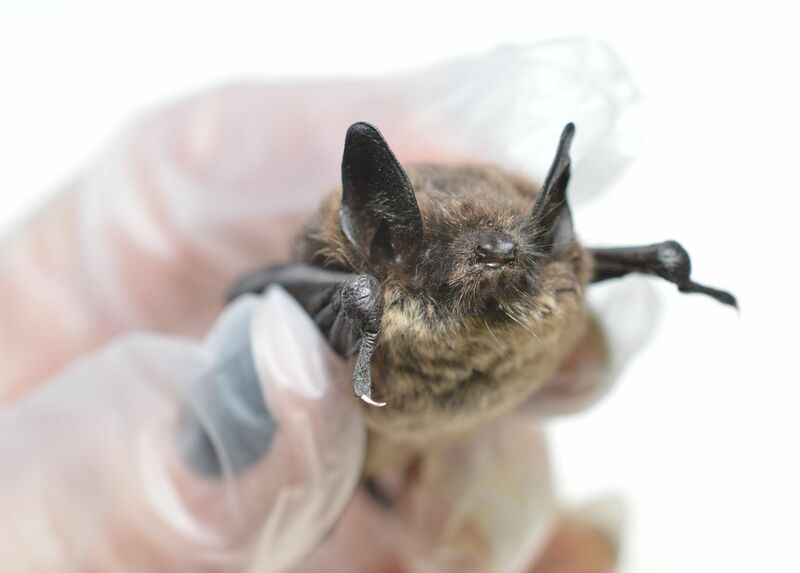 BEND, OR -- White Nose Syndrome has killed millions of bats in eastern North America, and was recently found in Washington - the first case in the Pacific Northwest. Deschutes National Forest officials are taking extra precautions to keep it from spreading here, particularly at the Lava River Cave near Sunriver. Jean Nelson Dean, with the Deschutes National Forest, says visitors can't wear clothing worn in other caves. "If they've gone into a cave somewhere else, even if it's within the Deschutes National Forest, they cannot take those materials into Lava River Cave without decontaminating them. And, we will have the ability for people to have their materials decontaminated out at Lava River Cave." White Nose Syndrome is a fungal disease spread by bat-to-bat contact. Nelson Dean tells KBND News, "Lava River Cave, like a lot of other very popular caves that receive a lot of visitation, is a greater concern for White Nose Syndrome, just because the potential for contamination is increased by the amount of people going through there - people coming from a variety of areas that have maybe gone into a cave someplace else." Experts advise against disturbing or handling bats, and ask visitors to stay away from areas bats live. They also ask visitors to wear clean shoes and clothing each time to go into a different cave. BEND, OR -- A Deschutes River Woods man faces drug charges, following a short-term investigation. The Deschutes County Sheriff’s Office Street Crimes Unit searched the Manzanita Lane home of Jason Prader, Thursday morning. The 38-year-old was taken into custody after investigators found street-level quantities of heroin, methamphetamine, scales and other evidence of drug sales. They also discovered a small, inactive butane honey oil (BHO) operation. BHO is an extremely potent form of hashish and can be inhaled for an intense high, without marijuana’s pungent smell. Prader is charged with Possession and Unlawful Delivery of Heroin, and a Probation Violation. BEND, OR -- With the end of two big internal investigations, this week, Deschutes County Sheriff Shane Nelson says it’s time to move forward. Former Captain Scott Beard pleaded guilty, Monday, to two counts each of theft and money laundering, stemming from crimes committed while he was employed by the county. He was accused of stealing more than $205,000 from the department. Sheriff Nelson says he will testify at the August sentencing. "I want him to be held accountable for violating the citizens’ trust. So, this does give closure in that respect. And, from the standpoint of restitution: I look forward to getting restitution from Scott Beard for the taxpayers of this county." Then, on Tuesday, the Oregon Attorney General's office announced corrections staff were not criminally responsible for the 2014 overdose death of an inmate. Nelson tells KBND News there were lessons learned from that tragedy. "A lot of changes came out of that investigation. We have the Alive-Lock wristband that measures oxygen levels; we went to 24-hour a day, 7-day a week nursing coverage. So, there are positives that come out of that." Nelson also acknowledges deputies were wrong to mock Edwin Mays before he died, as seen on surveillance footage. "Yes, we lacked professionalism in that video. And, discipline arose out of that: two people were demoted and two other people were disciplined." Mays' family is expected to continue with their wrongful death civil lawsuit, relating to that case. PRINEVILLE, OR -- A massive wildfire in Alberta, Canada continues to burn, destroying more than a million acres. Forty local firefighters are now in the region to help. Patrick Lair, with the Ochoco National Forest, tells KBND News 40 firefighters arrived in Canada on Tuesday. 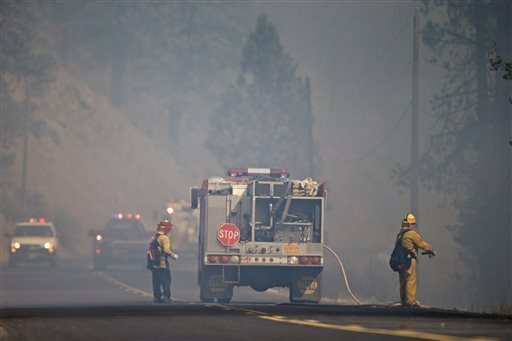 "They sent 20 folks from the Prineville Hotshots; they put together a 20-person crew made up of Forest Service and BLM firefighters - they're from the Ochoco, Deschutes and Prineville BLM. They're what we would call a 'Type II Initial Attack hand crew.'" He says they expect to be there for a while. "A typical assignment would be 14 days, could be up to 21 days, depending on the need. I don't have a lot of current information on the fires there, but I know it's huge. I think, the last time I checked, it was almost 1.3 million acres." The blaze is not under control. The northern edge is the most active, and the area has not received much rain lately. Local crews join about a thousand other firefighters from around the world, and the 1200 already in Fort McMurray. "It's just part of the Wildland Fire mission, I think, to band together and support each other when these fires occur," Lair says. "Because they do cross agency boundaries, they cross state lines. This is part of a working environment that we see these folks in, every year." 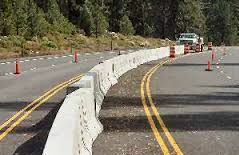 BEND, OR -- Crews will begin work next week on a new highway median, south of the Bend city limits. The median will stretch from Lava Butte north to Romaine Village Way, with a break to enter the High Desert Museum. Peter Murphy, with the Oregon Department of Transportation, says the project will increase safety on Highway 97. "Traffic volumes, particularly down there at Lava Butte, have been just skyrocketing. Last year, in 2015 was a 17% increase over 2014. And, this year, we’re already probably 5% above that." Murphy tells KBND News, "Putting medians in the middle, between two opposing lanes of traffic, you minimize the impacts of a crash. So, instead of somebody crossing from the southbound lane to the northbound lane, you kind of redirect them. That’s what those barriers do; they redirect that vehicle back into the same direction of travel. So, you may still get into a crash, but you’re going to be directed away from the oncoming travel." Traffic barrels are already in the area, an work begins in earnest on Tuesday. "What we’ll be doing is changing the traffic pattern in the area, by using those barrels to kind of control the flow. Depending on the work that’s taking place, they’ll be shifted either into one lane or, they’ll have two lanes but they’ll just go in a different, slightly out of the ordinary travel pattern," says Murphy. "Motorists simply need to be heads-up in the area and be aware of the traffic changes that are coming, so they’re not taken by surprise." Nighttime paving will occur in August, and the $6 million project should be done by late October. Click HERE for more information. SISTERS, OR -- Deschutes County deputies arrested two Portland men on drug charges, as they traveled to Central Oregon, Tuesday night. Investigators learned 29-year-old Tyler Binkley and 34-year-old Mason Suehs would be coming through Sisters with a commercial quantity of methamphetamine, which they allegedly planned to sell in Deschutes County. Officers stopped the vehicle on Highway 20, west of Sisters near Suttle Lake. They seized over a pound of meth, with an estimated street value of $15,000 - $20,000. Binkley and Suehs face multiple charges, including manufacturing and possessing meth. BEND, OR -- Bend police are investigating a shooting at the Rodeway Inn and Suites in southeast Bend, Tuesday night. The incident involved four transients. Detectives say two men were in a hotel room when they were confronted by two others. An altercation ensued and one man was shot in the leg. Two men left the scene in a dark blue Toyota Yaris, which was later found by investigators. The shooting victim was evaluated by Bend medics and taken to St. Charles Bend with non-life threatening injuries. Police continue to process the crime scene and expect to release more information at a later time. They say there is no outstanding threat to the community. REDMOND, OR -- After winning a local Shark Tank-style entrepreneurial competition, a group of Redmond eighth graders will present their idea to city officials, Wednesday evening. Elton Gregory Middle School Leadership teacher Marques Hase oversaw the team as they created a plan for an outdoor workout station in the Dry Canyon. They won $2500 in the "Teen Tank" competition, earlier this month. "They personally don’t get anything for winning, but the money is going to the project," Hase tells KBND News. "We did get some donations from Parr Lumber and the project managers; we have some general contractors who are going to volunteer their time to build this to code. So, with their help, we were able to reduce the costs greatly." He says students originally wanted to place various stations along the paved trail in the canyon, but after testing the idea decided it was more logical to cluster the equipment in one place. "It’s been awesome. A couple times, I kind of asked if they needed any of my help or needed me to contact people. They told me ‘no, we got it and leave us alone.’ And so, it was a little nerve-wracking on my end that they were going to do what they needed to. But, it was pretty impressive the leadership that they took, and took some pride in this and really worked hard." The kids also produced a 3-D model of their concept and are learning about the politics involved with turning it into a reality. 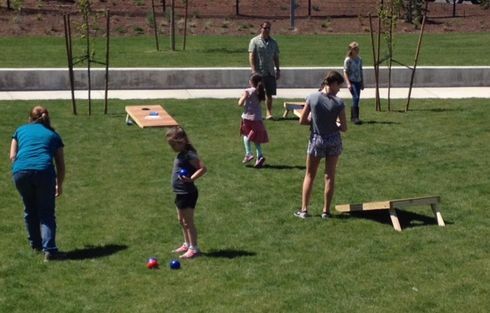 They'll present their idea to the Redmond Parks Committee, Wednesday. Hase says, "It sounds like this has been talked about before, so maybe with our involvement and a little publicity, we can make this come to happen." 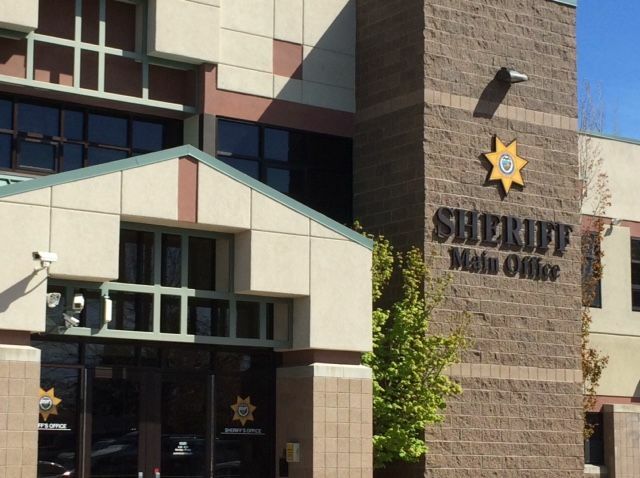 BEND, OR -- A 14-month state investigation into the death of a Deschutes County inmate has concluded no crimes were committed by deputies or jail administrators. Edwin Mays died of a methamphetamine overdose in December 2014. 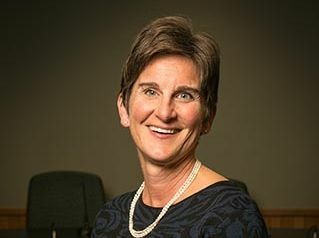 Deschutes County District Attorney John Hummel asked Oregon Attorney General Ellen Rosenblum to investigate the case to avoid any conflict of interest. "It wasn't her job to determine whether she was upset or bothered by what happened that night," Hummel tells KBND News. "It was her job to determine whether there was sufficient evidence to prove beyond a reasonable doubt that a crime occurred. She concluded there was not such evidence, and I support her in that decision." The report found Mays denied taking drugs the night of his arrest, and said he didn't need medical attention. He acknowledges mistakes were made the night Mays died. Jail surveillance video shows deputies making fun of Mays as he underwent drug withdrawal, although they did render medical aid once he became unresponsive. "What I saw on the night in question was deplorable. Government officials, government employees who work in that jail were mocking this man who was dying in front of them. It was grotesque and unprofessional. I shared that with Sheriff Nelson; he agrees and is taking corrective action." The decision against filing criminal charges does not stop civil litigation. Hummel says, "The Mays family is still alleging that the deputies and supervisors at the Sheriff's Department are responsible for the death of their loved one. So, that lawsuit will continue." BEND, OR -- We’re about a month away from the typical start of wildfire season. And, Deschutes County Emergency Manager Nathan Garibay says now is the time to work on creating defensible space. "Make sure that your home is prepared, that your family is prepared. And, I think before the fires come, that’s when you need to be thinking about it, you need to be doing things around your home and getting ready. When there’s smoke in the air, it’s probably too late. That’s just the unfortunate reality." Garibay tells KBND News preparing isn't difficult, but takes time. "Making sure there is defensible space around your home; ensuring that your home is prepared by having, preferably, non-combustible building materials; making sure that the pine needles and debris from the trees that blew all winter and have fallen on your roof and gotten in your gutters, are clear; that the landscaping around your home is cleaned up so that fire brands can’t get in there and start a fire next to your home." And, Garibay says creating 30-feet of defensible space can not only prevent a spark from turning into a full-blown wildfire, "It also gives firefighters a chance. If there is no defensible space and there are several other homes to protect, and they have limited resources, they may not be able to even try to save your home. So, you want to do what you can to help those firefighters when they are in your neighborhood trying to save your home." He says it’s also time to revisit general emergency preparedness with your family and make sure you’re familiar with the "Ready," "Set" and "Go" evacuation levels. Click HERE to learn more about each level. Central Oregon’s three counties recently partnered with Everbridge to launch a new emergency alert system. 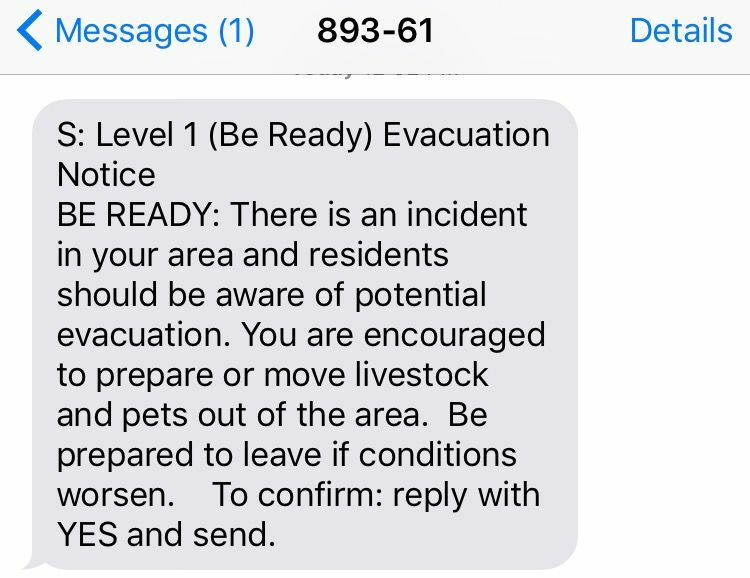 Garibay encourages residents to sign up for the free service, to receive evacuation alerts. Deschutes County residents can sign up HERE. Jefferson County residents, click HERE to register. And, Crook County residents sign up HERE. To hear more of our conversation with Deschutes County Emergency Manager Nathan Garibay, visit our Podcast Page. REDMOND, OR -- Summer brings several sports camps options for local kids. One upcoming camp features instruction from a local athlete now in the big leagues. Maarty Leunen grew up in Redmond, where he was a star basketball player. He took his talents to the University of Oregon and is now playing pro hoops in Europe. 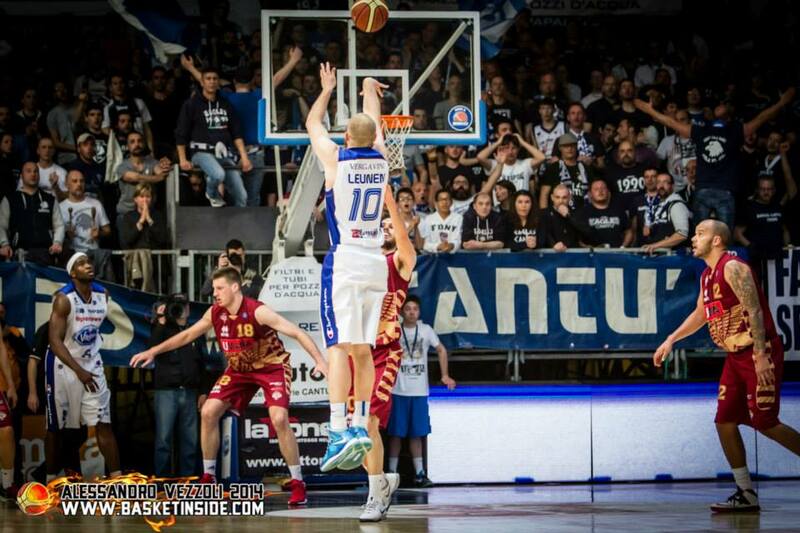 In the off-season, Leunen conducts hoop camps for local youngsters. "Redmond has been so good to me, and I want to continue to do my part to help the youth of Redmond and the Central Oregon area," Leunen tells KBND News. "This is a good way for me because I’m a kid that’s from Redmond, went to high school in Redmond, but then has gone on to play college basketball at a high level and on to play professional basketball." Leunen comes home from Italy in time to conduct his boys and girls basketball camp for third-through-12th graders. "I’ll be there every day working with the kids, running them through drills, giving instruction." The camp runs June 15th to the 17th. All proceeds go to support boys and girls basketball at Redmond High. BEND, OR -- State education spending has been fodder for political campaigns and pundits for years. "Currently, we do not fund them enough to be even average. We rank 39 in the nation in spending on each student, in Oregon; we’re 38th in performance; we have the third most crowded classrooms in the nation," says Robin Wisdom, with the League of Women Voters. 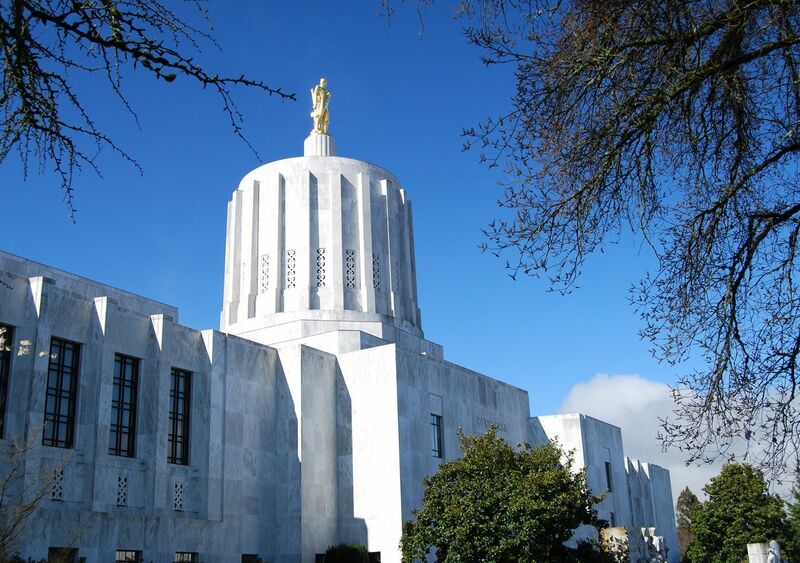 The League of Women Voters and Oregon Center for Public Policy are hosting forums across the state, in an effort to get fresh ideas from the public on how to fix the ongoing school budget crisis. Wisdom tells KBND News, "We’re asking everyone for their thoughts on the subject, their solutions. So, we’re trying to hit the state and ask this question: How can we make our schools better? We think Oregonians have the solutions." She adds, "That's not to say that great things are not happening in our schools today, because they are. There are wonderful teachers that are doing marvelous things, and students and parents, and we want to acknowledge that. We just know that even better stuff could be going on if we had better funding in Oregon for schools." Tuesday's "Great Schools, Great Communities" forum begins at 5:30 p.m. at the downtown Library. Wisdom says the feedback provided at these events will be compiled and provided to state officials. BEND, OR -- A Mountain View High senior is the overall winner for the Second Congressional District, in the 2016 Congressional Art Competition. 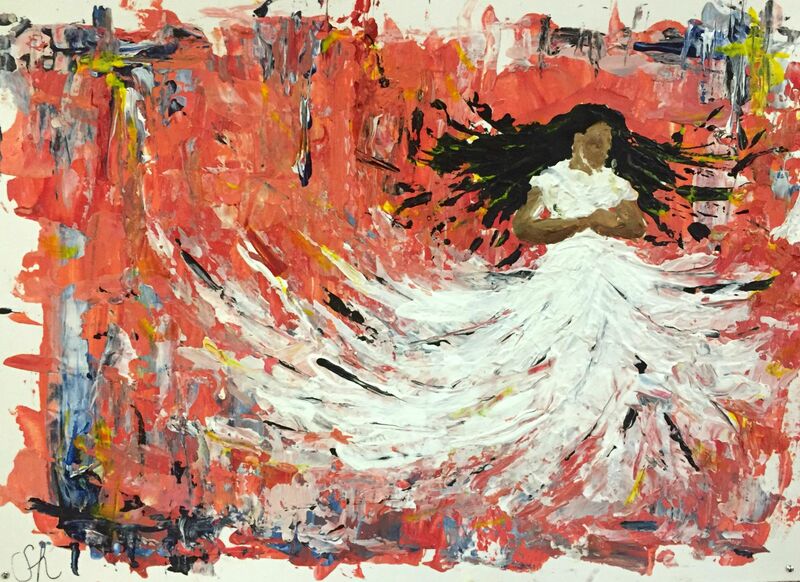 Sage Hassell's acrylic painting "Flaunt It," depicting a girl spinning in a white dress, was selected by local judges from among a number of submissions. Hassell tells KBND News, "I was so excited, I couldn't even believe it actually happened. I knew someone several years ago that won the award; I never imagined that I would get it." The Bend teen will travel to Washington, D.C. for a reception, June 23, and her winning piece will hang at the National Student Art Exhibit in the U.S. Capitol. "I started doing art in middle school and I've just taken it as an elective ever since. I guess my passion has grown exponentially with each year. My art teachers have been a huge influence. I would love to intertwine it into my future - I know I want to go into education. I've been thinking about math, but if I could be an art teacher also, or go back and forth, that would be incredible." Hassell plans to attend Brigham Young University in the fall. Judges also chose winners from the nine counties within the Second District; that artwork will be displayed at Walden's district offices in Bend, Medford, La Grande and Hood River. 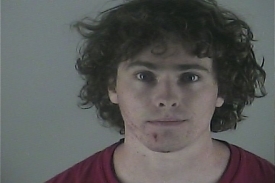 REDMOND, OR -- Two Redmond teens could face serious charges stemming from a May 19th incident. Police arrested Dakota Ortwein and Reyanne West, both 17, last week, for trying to kill Ortwein's mother. Evidence is currently before the Deschutes County Grand Jury; a charging decision is expected on Friday. If the couple is charged with Attempted Murder, Measure 11 mandates they be tried as adults. BEND, OR -- Former Deschutes County Captain, Scott Beard, pleaded guilty in Federal Court to theft and money laundering charges, Monday. Those crimes occured while he served as commander of the Detectives' Division for DCSO. Sentencing is scheduled for August 23. Beard faces up to 60 years in prison and a $1.2 million fine. However, the U.S. Attorney's Office is asking for a five-year prison term and for Beard to be forced to pay restitution to Deschutes County. Beard was arrested in February, and subsequently fired. Last September, an internal audit found discrepancies in documentation of funds from drug investigations. 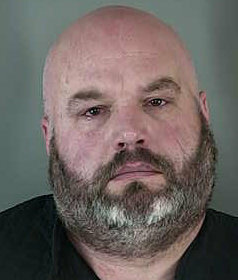 Detectives discovered Beard stole more than $200,000 in cash and property seized by the agency. Monday, May 23, 2016: LA PINE, OR -- Investigators are asking for the public’s help in locating a 64-year-old La Pine man, who hasn’t been seen in a week. Jimmy Alen Robins left his home early last Monday (May 16) and may have been headed to Wickiup Reservoir or the Upper Deschutes River. He’s driving a white and blue 1985 Ford F150 pickup with Oregon plates: 982-BSK. Robins is 5’7” with partially gray hair and blue eyes and was last seen wearing a red and yellow plaid shirt, blue jeans, tennis shoes and a cowboy hat. The Deschutes County Sheriff's Office is searching possible locations, but has so far found no sign of him. Anyone with information on Robins' whereabouts is asked to call the Deschutes County Sheriff’s Office at 541-693-6911. Tuesday, May 24, 2016 UPDATE: Jimmy Alen Robins' pickup was discovered Monday on private property between Brothers and Christmas Valley. His body was found a short distance from his truck. The Lake County Sheriff’s Office is investigating his death but say it does not appear suspicious. SALEM, OR -- A pilot project in Oregon, that would replace the gas tax with a device drivers plug into a vehicle, is nearly a year old. Michelle Godfrey, with OreGo, says around a thousand vehicles are taking part, and the retention rate is currently 95%. "Given that a lot of them are actually paying a little bit into the system, that’s a pretty good retention rate." She says there were some minor technical issues that have since been resolved. The OreGo device monitors the miles driven and the gas tax paid at the pump. High mile vehicles pay more, low mileage vehicles get money back. Other states are also testing the devices, but Oregon is the only one actually connecting the technology to payments. The results of the pilot project will go to Legislators to determine whether the gas tax will be abolished in exchange for outfitting all vehicles with the devices. BEND, OR -- Bend City Councilor Sally Russell is ready to take on a new challenge. She recently talked with The Source Weekly's Brian Jennings about where she sees herself in five years. She says, "In the next couple of years, I see myself as Mayor. I think I'm ready to become the Mayor of Bend, and I think it's about time that the community would like to see a woman as the Mayor of Bend. So, we'll look at how that plays out." Russell is up for re-election this fall. She tells Jennings the city will continue to tackle several controversial issues, like the Urban Growth Boundary (UGB), affordable housing and managing growth. "I really believe our biggest challenge is acquiring the skills to listen to each other and hear each other. What I see a little bit on Council - the more we end up getting into our silos and just listening to those voices that we agree with, that we think syncs up with our value sets - And, I think the more we do that, the more isolated we become in our thought corners." She has deep roots in Oregon. Her father's family was among the first to migrate to the state in 1853. And, her mother, Nancy Russell, was the first Executive Director of the Friends of the Columbia Gorge. Many credit her with leading the charge to designate the Gorge as a National Scenic Area. Click HERE to listen to the full podcast from The Source Weekly. TERREBONNE, OR -- A Warm Springs man wanted in connection with his wife’s death, last week, was found dead at the bottom of the Deschutes River Canyon, near Terrebonne, over the weekend. FBI agents and Warm Springs Police were looking for Mark Kevin Johnson Jr. as part of the investigation into the violent death of his wife, Candelaria Rhoan. Deschutes County deputies discovered Johnson’s body inside his pickup, more than 100 feet down the slope of a sheer cliff near Lower Bridge Way, Saturday afternoon. They were forced to delay the recovery until Sunday morning, due to the terrain. Deschutes County Detectives continue to investigate the vehicle incident in cooperation with the ongoing death investigation in Warm Springs. BEND, OR -- Cascade Middle School was put into "lock-out" for about an hour, Friday afternoon. "The staff there had received information that there was a threat to the school, so they followed their protocol. They did an outstanding job of putting their kids into a safe position by going into the lockout," Bend Police Lt. Jason Maniscalco tells KBND News. Nearby Seven Peaks School also implemented additional security measures during the investigation. Lt. Maniscalco would not release specifics on the nature of the threat, but says school officials acted appropriately. "We sent officers there and made sure the kids were secure, then we began our investigation. Once we received the information about who made the threat, we contacted them. They were not on campus and they were subsequently arrested for disorderly conduct." "I want to express my appreciation to Bend Police Department for their expeditious response to our school" Cascade Principal Stephanie Bennett said in a letter sent home with students Friday afternoon. "I also want to make it clear that we will not tolerate copycats. Anyone found making threats to our school will be disciplined and subject to prosecution to the fullest extent of the law." The Bend-La Pine School District has a "text a tip" line at 541-600-4267 for parents or students to notify officials of potential threats. MADRAS, OR -- After a woman and her three boys were killed in a crash south of Madras, earlier this week, many who drive that stretch of Highway 97 have spoken out about the dangerous nature of the intersection. There is no turn lane at Bear Drive, which some claim would have saved Anita Bemrose from getting rear-ended, then pushed into oncoming traffic, while she waited to turn off the highway. Joel McCarroll, with the Oregon Department of Transportation, says, "About 70% of our crashes are roadway departure crashes, where people leave their lane. So, we’ve focused on rumble strips, because that’s the most cost-effective way to reduce road departure crashes. But, we’re also looking at intersection crashes, and that’s why we’re putting signing upgrades at different locations." He adds, "We did a study of all of the intersections statewide, and basically created a threshold at which we would put up improved warning signs on the highway. So, it would be ‘intersection ahead: Bear Drive.’ And then, signing on the side street to reduce the risk of people running the stop sign." McCarroll tells KBND News, "There’s a project planned to install those signs [at Bear Drive]. We’re going to repave the section, basically from Madras to Juniper Butte, in a couple years. At that time, we’re going to upgrade the intersection signing there, and a couple of other locations in the corridor, and also install rumble strips and upgrade the striping." According to ODOT crash statistics obtained by KBND news, the intersection does not see more crashes, on average, than other similar intersections in Central Oregon. But, McCarroll says the agency is still trying to improve safety. "What we try to do, as the state transportation agency, is try to intercede on the things we can do to make the roadway safer, even if those things don’t necessarily solve all of the crashes." And, he says a turn lane is not the right fix, even there was funding available for such a project. "A left turn lane, at an intersection like Bear Drive, reduces the risk of one type of crash, which would be a left turn off the highway, but then increases the risk of another type of crash, which is the left turn onto the highway because that left turn then becomes much longer." He says it’s difficult to know, yet, if increasing speeds to 65-miles per hour, earlier this year, played a part in Tuesday’s deadly accident. A GoFundMe page, created to help the surviving family pay medical and funeral expenses, raised more than $28,000 in its first day. WASHINGTON, D.C. -- Supreme Court nominee Merrick Garland continues to meet with Senators, even though Republican leaders won't allow confirmation hearings to proceed. Garland is the Chief Judge of the D.C. Circuit Court. He graduated from Harvard Law and has worked in private practice and for the U.S. Department of Justice. Garland met with Senator Jeff Merkley (D-OR) on Thursday. Merkley called the judge "thoughtful and knowledgeable," and said delaying his confirmation is having an impact. "It is a direct attack on the integrity of the court, and it’s going to do deep and lasting damage to the integrity of the court." Senator Merkley says the GOP's refusal to hold hearings goes against the Constitution. In several cases, current Supreme Court Justices have been split on decisions, and decisions by lower courts have been allowed to stand. 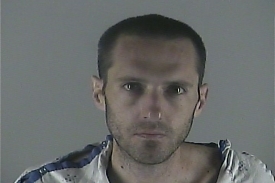 BEND, OR -- a Madras man was arrested this week, in connection with a March burglary at Columbia Bank. Bend Police say public tips and good detective work led investigators to search the home of 22-year-old Ethan Gregg. While executing a search warrant at Gregg's home, officers say they found evidence associated with the break-in. His vehicle also matches the pickup seen in security footage. Police believe Gregg broke the glass door to get inside the Third Street branch of Columbia Bank, after it closed for the day, March 16. A janitor was inside at the time, but hid from the suspect. MADRAS, OR -- A Bend man and his dog are recovering from a cougar attack, early Thursday morning. Rick Smith was camping at the East Shore Forest Service Campground at Haystack Reservoir, when he heard his dog cry out at about 3 a.m. He told The Source's Brian Jennings, "Came out here to Haystack to go fishing. My dog was chasing something up on the hill and all of a sudden he started screaming bloody murder. I knew something was wrong, so I ran back and grabbed my rifle - I didn't have it loaded at the time - ran up on the hill there and saw the cougar had him by the back of the head. So, I ran up and grabbed the cougar with my hands and tried to bust his jaw. And, the thing bit me." Smith called 911 and they arranged to have a vet meet him and look at "Briar," the dog. Overall, Briar's injuries are described as minor and he should make a full recovery. "He's got two pretty good puncture wounds right on the back of his head, two puncture wounds over his right eye and one over his left eye; his right ear is messed up," says Smith. "But, with that said, he's OK. They pumped him full of antibiotics and gave me a bunch of meds for him. He's a lucky boy!" He adds, "If it had been an adult cat, my dog would've been dead because as deep as the puncture wounds are, it's right on his spine. Yeah, he's very lucky it didn't kill him." Smith also sought medical attention and should be fine, "Other than being really shook up." He tells Jennings, "I mean, I've killed probably close to 30 cats in my lifetime, and this cat was extremely aggressive." The Jefferson County Sheriff's Office is closely monitoring cougar activity and will take appropriate action where and when needed. They have yet to find the cougar responsible for the attack. Click HERE for the full podcast from The Source Weekly. 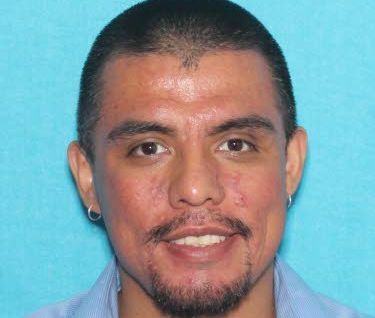 WARM SPRINGS, OR -- A Warm Springs woman was found dead inside her home, early Thursday morning, and her husband is wanted for questioning. Warm Springs Police discovered the body of 30-year-old Candelaria Rhoan while conducting a welfare check. An autopsy is pending, but investigators believe she died violently. 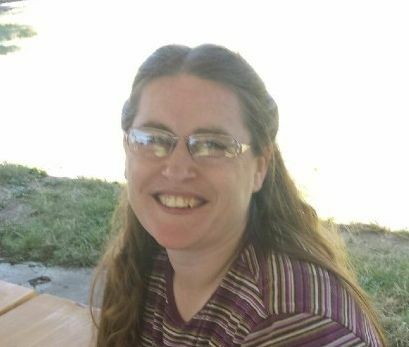 Her husband, 33-year-old Mark Kevin Johnson, Jr., was last seen at a friend's house in Warm Springs, Wednesday afternoon. Johnson is about 5'8" tall, 190 pounds with black hair and brown eyes. He and his wife are tribal members. 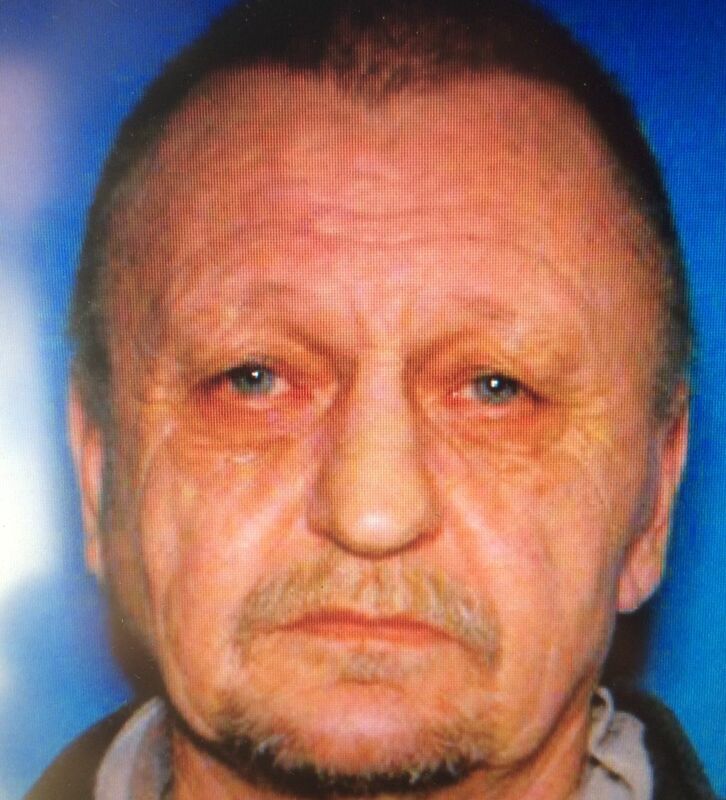 Investigators believe Johnson is driving a 1998 maroon four-door Volkswagen Passat with Oregon license 223-DXW. Police consider him armed and dangerous and say he may be suicidal. Anyone who knows his whereabouts is asked to call 911. Those with information on the investigation should call Warm Springs Police at 541-553-1171, or the FBI at 541-389-1202. REDMOND, OR -- After nearly three weeks of runway paving work, the Redmond Airport will reopen to air traffic, as scheduled, on Monday. Mayor George Endicott says he and other city officials toured the project, earlier this week. "We actually, while we were on our tour, they poured their last bit of pavement. We didn’t arrange it that way, but we actually watched them pour the last piece of pavement. So, they’re done. Friday they’re out of there; Monday the airport will open." Roberts Field closed at the beginning of the month so crews could repave a section where the two runways intersect. Endicott says during the closure, crews took advantage of a relatively empty terminal to complete work inside, as well. "If you go upstairs, the restaurant is, I think, tripled; we’ve done a deep clean on everything. It’s been a few years since we built the terminal, so all the carpets, the tile, fresh paint – Some of that you’re not going to notice, per se. And, all these tests - the live fire exercises and everything, that gave everyone an opportunity to do things that we wouldn’t have been able to do otherwise." While work on that runway intersection is complete, the full project will continue into summer. "We will still be using the auxiliary runway until we finish the main runway, which is still a couple of months out," Endicott tells KBND News. "But, the closure all had to do with fixing the intersection, and that’s done." MADRAS, OR -- A Bend man says his dog was attacked by a cougar, early Thursday morning, at Haystack Reservoir. According to the Jefferson County Sheriff's Office, when the man was camping at the East Shore Forest Service Campground, he went to investigate why his dog was barking at about 3 a.m. and saw the cougar attacking his 90-pound lab. A deputy searched the area, but did not find the cougar. He did confirm the dog's injuries are consistent with a cougar attack. The dog was taken to East Cascade Vet Clinic in Madras with puncture wounds and abrasions. The injuries, overall, are described as minor and the animal should recover fully. The Sheriff's Office is working closely with the Forest Service, OSP's Fish and Wildlife Division, The Bureau of Reclamation and Oregon's Department of Fish and Wildlife to monitor cougar activity in the area. 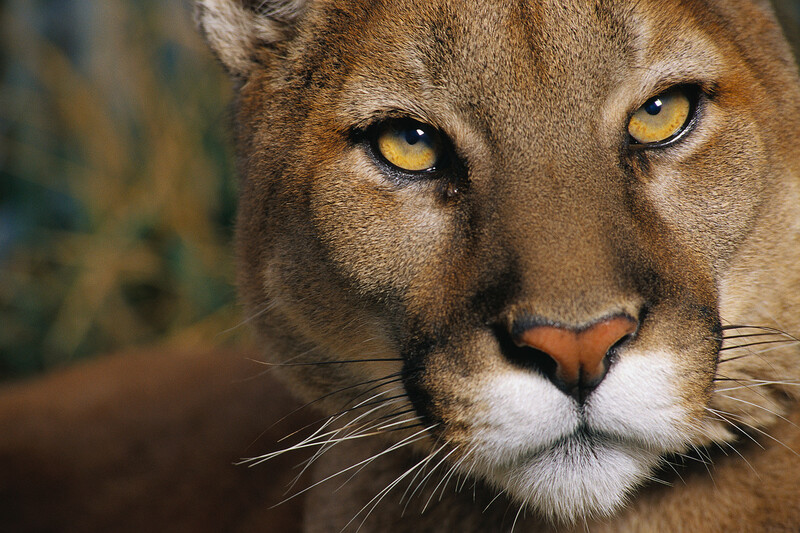 Anyone sighting or encountering a cougar is asked to call 911 or non-emergency at 541-475-2201. If you spot a cougar, don not run. Make noise and appear as large as possible. Raise your arms and open your coat, if you can. Always keep children and pets close when hiking or camping in cougar habitat. 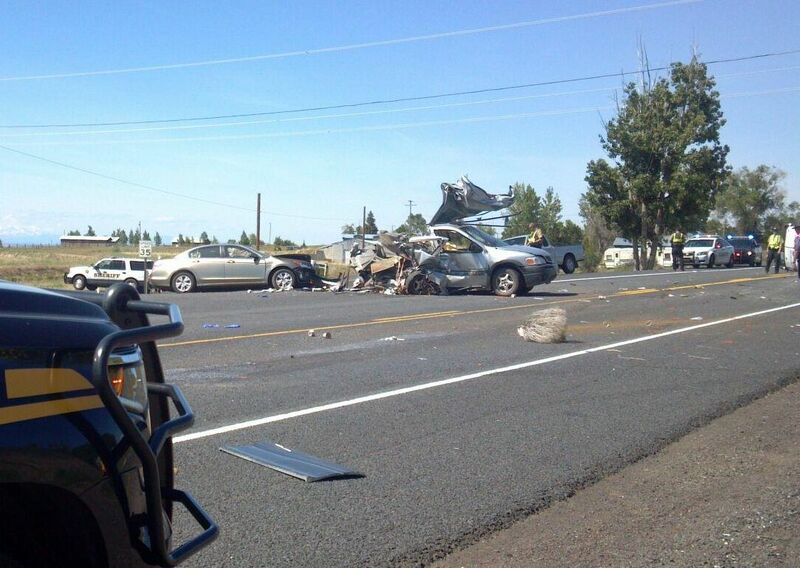 MADRAS, OR -- The Madras community is feeling the loss, following Tuesday afternoon's horrific crash on Highway 97. Anita Bemrose and two of her sons died that day. Her youngest son died at the hospital, Wednesday. Anita was the mother of eight, and the family also had a foster child. The boys who died, Elliot, Ned and Wyatt, ages 10 to 14, were her youngest. She homeschooled the kids and they all volunteered at the Jefferson County Library and a community food pantry. Librarian Lorene Forman knew the family well. "They're a very close-knit family; very tight. All of the kids and family were very close to one another." She tells KBND News, the family's loss is immense, and felt by everyone who knew them. "Very sweet, giving people. And, kind of a sense of community and giving and you know, dedication of reading, of course, they all had that. But, beyond that, it was their sense of their kind of loving, open, kindness aspect of the character of all of them. Because, Anita's children - she raised them all to be giving like she is." Forman and other community members have set up a Go Fund Me page to help the surviving family. Donations can also be made to the "Bemrose Memorial Fund" at Columbia Bank. "They're going to have huge expenses, and this is a family that doesn't have a lot of resources - financially," says Forman. "So, anything that can be done to help them with their expenses for funerals and for medical; it's going to be huge." REDMOND, OR -- Six people were arrested this week, after Redmond Police raided a home near SW 26th and Glacier. The Redmond Police Street Crimes Unit received information that those inside the home may be actively engaged in the sale and distribution of drugs. They served a search warrant on the property at about 10 p.m., Tuesday. Investigators seized about four grams of methamphetamine and two grams of heroin, as well as scales and packaging material. Nine people were contacted during the execution of the search warrant, including an underaged girl. The six arrested are Sarah Gittins, Evan Hawkins, Michele Brownfield, James Dacus, Chance Wester and Kendra Fraga. They each face multiple charges, ranging from meth possession to frequenting a place where drugs are used. BEND, OR -- Deschutes County Sheriff Shane Nelson has placed another employee on paid administrative leave for "violating Sheriff's Office policies." Sheriff Nelson did not elaborate on the allegations against Patrol Lt. Tim Leak, other to say they are not criminal in nature. The Sheriff's Office became aware of the violations through the ongoing administrative investigation by Captain John Bocciolatt. Lt. Leak was placed on leave after new information came to the attention of command staff in the last week. This follows the firing of one captain and the resignation of another for wrongdoing, in the last couple months. WEDNESDAY UDPATE: According to Oregon State Police, the 10-year-old survivor of Tuesday's crash succumbed to his injuries while being treated at St. Charles Bend. Click HERE to read about efforts to help the surviving family. MADRAS, OR -- A Madras woman and two of her sons were killed in an accident on Highway 97 south of Madras Tuesday afternoon. The two boys, ages 12 and 14, were pronounced dead at the scene. Their mother, 49-year-old Anita Bemrose, was flown to the hospital, where she later died. A 10-year-old son is at St Charles Bend with life threatening injuries. Oregon State Police say Bemrose was about to turn left onto Bear Lane, just after 2 p.m., when the car behind her nearly hit her and passed on the right shoulder. A second car couldn’t stop and rear-ended Bemrose's van, sending it into the southbound lane where it struck another vehicle. The other drivers suffered non-life threatening injuries. 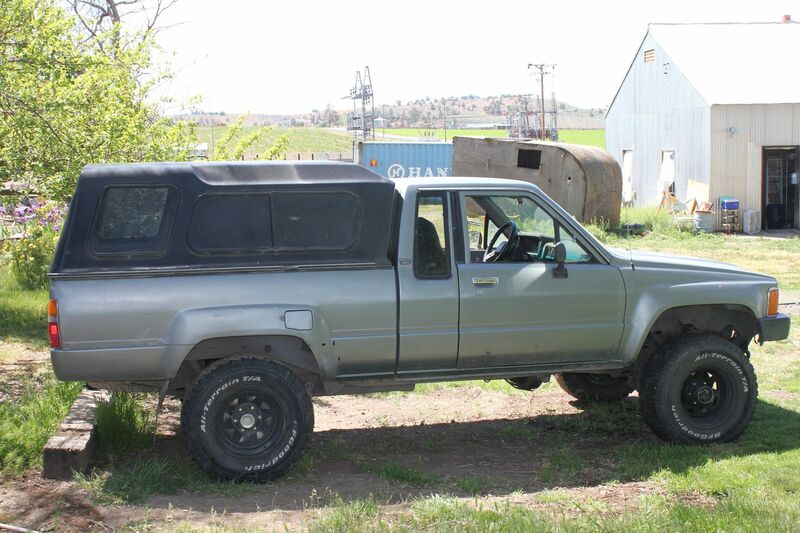 OSP is asking for the public's help to identify the vehicle that passed the van on the right shoulder. BEND, OR -- Deschutes County voters overwhelmingly approved a permanent funding levy for the 911 service district. Preliminary results show nearly 72% of voters said yes to replacing the current combination of levies. "To have a number like that is just remarkable, and humbling," 911 Director Steve Reinke tells KBND News. The measure will levy up to 42.5 cents per $1,000 of assessed property value. Reinke says, "The results of this levy mean that in the future, we're not going to need to keep coming back to the public every five years for operating levies. And, that's going to allow us to forecast into the future what our long-term capital needs are. We're going to be able to put money aside to make sure that when the radio system, that we're building today, runs to its end of life in 50 years that we'll have the money in the bank to pay for it without going into debt or doing bonds." 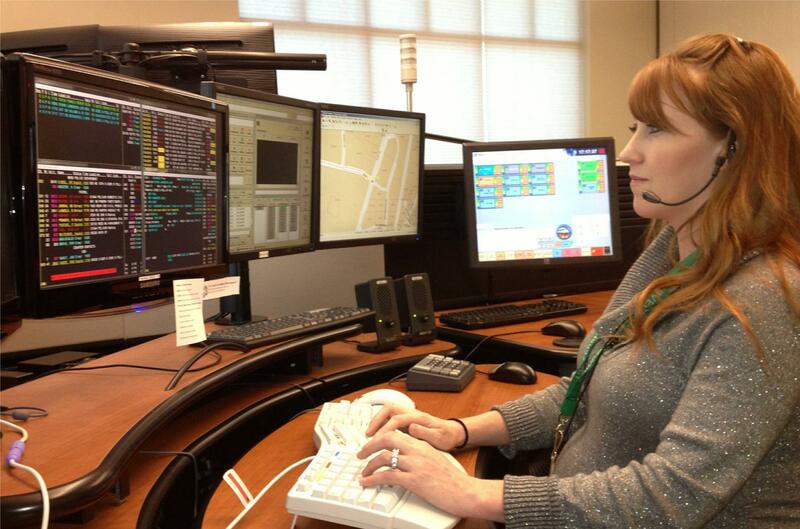 He says the money will also be used for long-term maintenance of that new system and will allow the agency to hire more dispatchers. "We want to make sure that we continue to offer the best 911 service that we possibly can to the members of the public who call us, to the responders that we serve," says Reinke. "It's just a remarkable vote of confidence." The new rate won't go into effect until 2018, when the current combination of levies expire. And, Reinke says the rate will only go up if and when needed. BEND, OR -- Sam Carpenter lost his bid for the Republican nomination for U.S. Senate, Tuesday night. The Bend businessman came in second, about 5.5% behind Portland I.T. specialist Mark Callahan. Carpenter tells KBND News, "Mark Callahan has run several times before on various tickets - Republican, Democrat, Green - so, his name recognition is better; that's the only thing I can assume happened, here." He says the loss is disappointing, but he's moving forward. "Right now, I've got another book to write and a couple of businesses to get back into high gear. We're in good shape here. I employ about 40 people in Bend, and I intend to keep them employed; and add some more, if I can." Carpenter runs Bend-based CentraTel. Two years ago, Carpenter filed to run against Senator Jeff Merkley. But, dropped out to endorse Jason Conger in the Primary. "This is OK. The voters have spoken, and I'm happy about it, if that's the way it goes. I'm perfectly fine with the results, and I wish Mark Callahan the best of luck." He has not ruled out a future run for office. REDMOND, OR -- Redmond’s building division is asking City Councilors approve a 20% increase in building permit fees. Aaron Yuma says rates have not changed in about a decade. "We’ve got a small staff; we are experiencing about three times the rate of growth for activity in permits as we were this time last year with the same staff. And, our fee structure should be built in such a way that the additional activity would automatically bring in the fees that we need to hire additional staff." 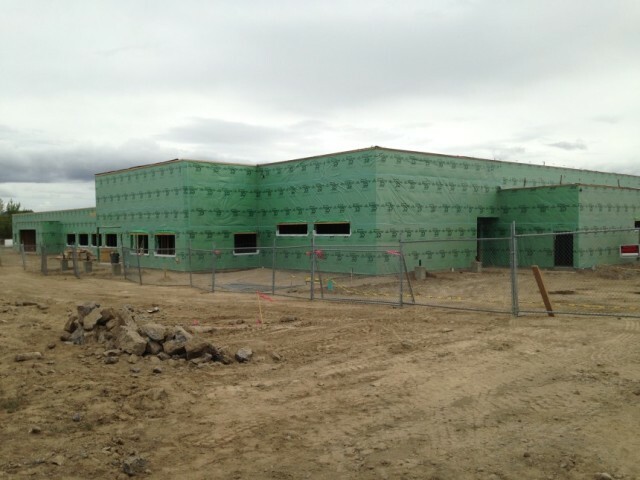 But, Yuma tells KBND News that rate is not keeping up. "Typically, we would turn a permit around in about two weeks; and right now, we’re running anywhere from four to five weeks." He says a consultant recently recommended a rate hike, to allow the department to be self-sustaining. "This is what we think we need to do to fund the department in such a way that we can provide the level of service our community expects." Under the current fee structure, the Building Division budget is supplemented by the city's General Fund. "The hope is that we sort of stop the bleeding, so to speak, with this 20% increase," Says Yuma. "And, we will have further discussions to look at the recommendations from the consultant and see if we want to take steps in the future to bring ourselves more in alignment with most building departments in the area." A public hearing is scheduled for 6:30 p.m. next Tuesday, to get feedback on the rate hike proposal. PRINEVILLE, OR -- The race for Crook County Judge is now a two-person contest. County Commissioner Ken Fahlgren was the top vote getter, Tuesday, with 40% of votes cast. Fahlgren tells KBND News Crook County is in the midst of some positive growth processes. “We will be gaining jobs at the airport; jobs in our community. Growth through a Connect Oregon grant for over $2 million, it looks like it is a success, or will be in the summer. Another 1.6-million that will be through FAA, and all of which might create 60 new jobs. It feels like we have a glass half full.” Fahlgren also points to the completion of the three-year, 15-mile Milliken Road project as another sign of positive energy in Crook County. The third candidate for County Judge was former Chair of the Central Oregon Patriots, Craig Brookhart. He received only 21% of the vote. BEND, OR -- Ballots will be processed, beginning at 8 p.m.
For Deschutes County results, click HERE. For Crook County results, click HERE. For Jefferson County results, click HERE. And, for statewide offices, visit the state's website. Tune in to the KBND Morning News Wednesday, beginning at 5 a.m. for complete analysis of Tuesday's Oregon Primary. 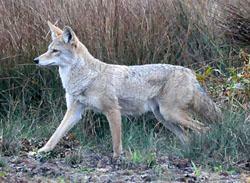 He says coyotes pose little threat to people. SISTERS, OR -- Sisters officials released the report on the investigation into ex-City Manager Andrew Gorayeb, Monday evening. It offers insight into why City Councilors offered him a six-figure severance package to resign. The report, obtained by KBND News, describes Gorayeb as abrasive, but finds his conduct did not rise to the level of bullying or harassment. The investigator conducted 15 interviews, including with Gorayeb. According to the report, most employees felt Gorayeb improved productivity at City Hall, but those of whom he was critical found it to be a negative work environment. Several employees described Gorayeb's use of derogatory nicknames for past employees, City Councilors and members of the community. He called them things like "Wicked Witch of the West," Nurse Ratchet" and "Princess." He was openly critical of some employees' work and criticized others for bad-mouthing him and the city within the community. It appears, if Gorayeb liked someone's performance, that person probably didn't have any issues with him. But if he didn't, City Hall was an intimidating and difficult place to work. There were also allegations that Gorayeb pressured staff to give his wife, a local real estate agent, special treatment. Some claim he prioritized developments she was working on, allowing permits to be issued in a faster timeframe. The investigator found that, although Gorayeb didn't explicitly tell staff to approve permits quicker, he created an environment that implied such action to staff. Gorayeb resigned as Sisters City Manager at the end of April. He denied any wrongdoing, and Councilors agreed to pay him 12-months of salary, including benefits. 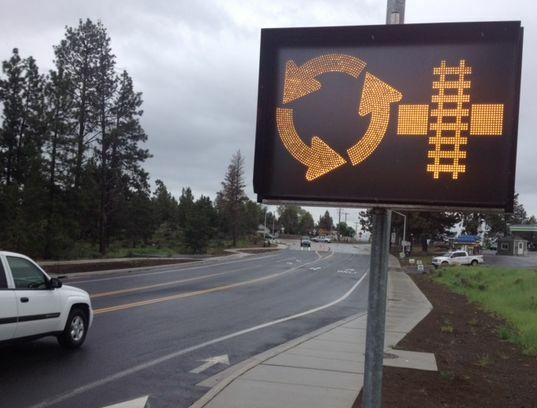 BEND, OR -- Drivers using the roundabout at 15th and Reed Market Road are getting some help to avoid getting stuck in line behind a train. When a train crosses Reed Market now, a signal is sent to electric signs posted for drivers approaching the roundabout from the north, south and east. Those electronic warning signs are only illuminated when a train crosses Reed Market Road. SISTERS, OR -- A head-on crash outside of Sisters left two Redmond men in critical condition. 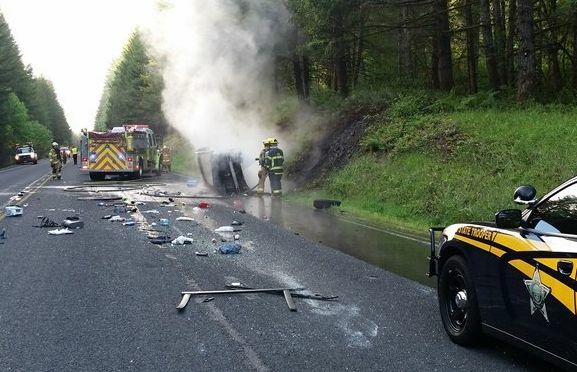 The accident happened on Highway 20 just before 7 a.m. Monday, west of Suttle Lake. Oregon State Police say 20-year old Fredi Torres-Reyes, of Woodburn, lost control of his car on a curve and spun into the path of an oncoming SUV. Torres-Reyes was taken to St. Charles Bend with non life-threatening injuries. Police say speed may have been a contributing factor in the crash. They also discovered Torres-Reyes was driving with a suspended license. Several passing motorists stopped to help the two men in the other vehicle. Republican Gubernatorial candidate Dr. Bud Pierce was traveling from Salem to Bend for an interview with KBND News and says he performed CPR and stayed with the victims until medics arrived. The driver of the SUV, 71-year-old Terje Walthinsen, and his passenger, 38-year-old Timothy Walthinsen, were flown to St. Charles with life-threatening injuries. As of Tuesday morning, they were listed in critical condition. Highway 20 was closed for five hours during the investigation. 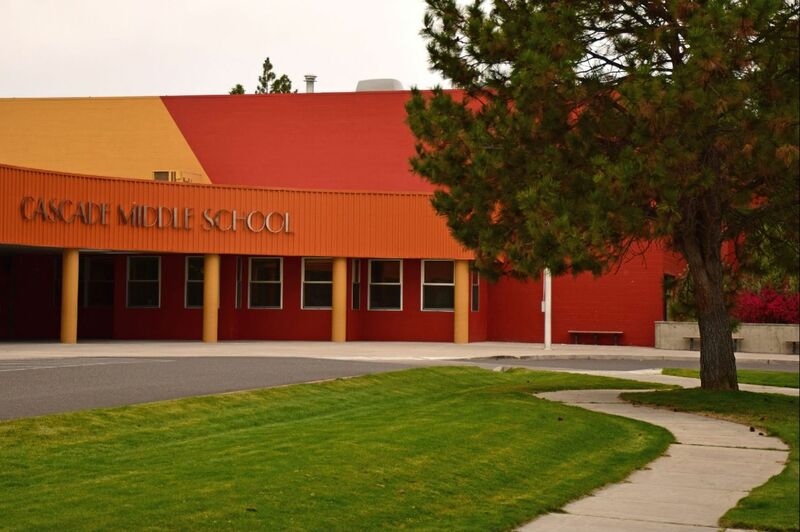 REDMOND, OR -- Middle school students at Redmond Proficiency Academy have just two weeks left in this academic year. Then staff will pack up for the charter school’s big move. RPA Director Jon Bullock says they have to be out of the Hugh Hartman building by June 10, but the new facility, just two blocks away, won’t be ready until mid-August. "Construction is going fabulous. Griffin Construction is our general contractor, and they’ve been amazing. We’re on time and under budget, right now." He tells KBND News there is an agreement with the school district allowing RPA to store everything at Hartman, in an area that won’t interfere with the building’s conversion into an early learning center. "This is not a taxpayer responsibility. The charter school has to fund the facility by itself on the funds it receives, so there’s no taxpayer money going directly into this as a traditional school bond would do," says Dr. Bullock. "That’s a question some people have had. They say, ‘we didn’t vote on that!’ No; that’s because we went out and sold municipal bonds to make it happen." RPA recently signed a five-year lease on a building at SW 7th and Evergreen in downtown Redmond, for a new performing arts center. The school is taking over the current location of Desert Song Church, which is moving into the former Centwise Hardware store. That performance center will include band, choir and theater space, and should also be ready by mid-August. 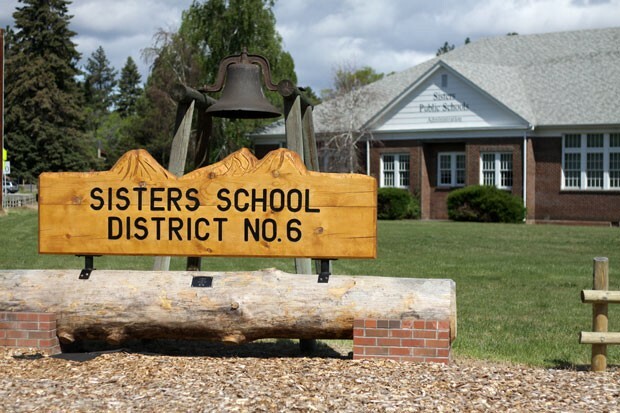 SISTERS, OR -- Sisters voters will decide Tuesday whether to approve a $10.7 million school bond. The funds would go toward school improvements and renovations, and build a new ball field and tennis courts. Resident Jay Wilkins supports the bond. He tells KBND News, "The facilities are in need of that kind of investment, now. I believe the investment is really needed, especially in that head wind of school financing, just in general, schools are facing." Two years ago, voters rejected a larger $14.5 million dollar bond request. Wilkins believes this time is different. "In general, I would so the majority seem to appreciate the process that got us here. They appreciate the improvements in the ask that we made since the previous bond attempt that was larger and maybe not as clearly defined, in terms of how it would be used. I think, for the most part, people recognize we have to invest in our kids." For me, personally, I'll never set foot on a tennis court; just not a tennis player. So, I can't say 'gosh, that's the most important investment as a district. we have to have a tennis court.' But, I'm comfortable with process that got us here, and the process that went into prioritizing these particular investments on behalf of the community. And that argument that says when you look at the neighboring districts, the lack of a tennis court or the lack of a baseball field and what it means for the community, I get comfortable with that." There has been no organized opposition to the measure. BEND, OR -- Bend firefighters responded to two house fires started by lightning, during this weekend’s storm. Crews found fire in the basement of a home on Northeast 12th, at about 4 p.m, Saturday. Investigators say lightning struck a tree, sending an electrical charge to the house. 45 minutes later, fire crews responded to a home on Bunker Hill Court, in the Broken Top subdivision. They found damage to the roof and flames in the attic and second story. Both fires were quickly brought under control and caused more than $100,000 in damage to each home. 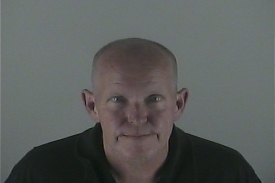 BEND, OR -- A Bend man was arrested after allegedly threatening employees with a knife at a fast food restaurant, Saturday afternoon. 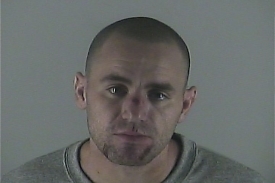 Police say Ahren Antonio Lopez-Bierer went to the Taco Bell at NE 27th and Highway 20 to confront his girlfriend. When she wasn’t there, he entered the employee area to use the phone, but was confronted. He allegedly grabbed a knife from the kitchen, threatened two employees and left the restaurant. 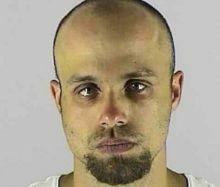 He was arrested in the parking lot of the Bend Church of the Nazarene, several blocks away. The knife was found near Taco Bell. 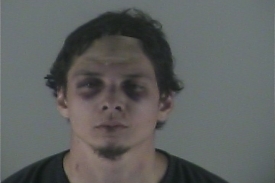 Officers say he intentionally hit his head on the back of a police car. During an evaluation at the hospital, they say he intentionally spit blood on police. He faces a number of charges, including menacing, aggravated harassment and theft. Lopez-Bierer was also wanted in connection with an altercation with his roommate that occurred Thursday. REDMOND, OR -- Redmond school bus drivers will try to "Fill the Bus" with food donations, this weekend. It was organized by dispatcher Donna Walker to benefit the Redmond Community Food Bank. "Our goal is to teach the kids to start charity at a young age, and to know that not everybody is as lucky as they are sometimes. By doing this, we make it fun for the kids to do charity, and we also help the local food banks. This time of year, they don’t get a lot of donations. Christmas everybody think of them; but this time of year, they struggle a little bit." Donations of non-perishable food and personal hygiene products can be made Saturday from 8 a.m. to 3 p.m. at the Walmart on the north end of Redmond. Donations can also be made next Saturday, May 21, at Bi-Mart on the south end of Redmond. Kids can also win prizes through games and activities. Click HERE for more details. Walker tells KBND News, "We’re excited; it’s going to be a great day. We hope everybody comes out and brings some food. If you don’t have that, come by and say 'hi' to us and meet the bus drivers, and kind of see what they’re about; they’re very, very generous. These bus drivers do a lot for the community that people don’t always know about." 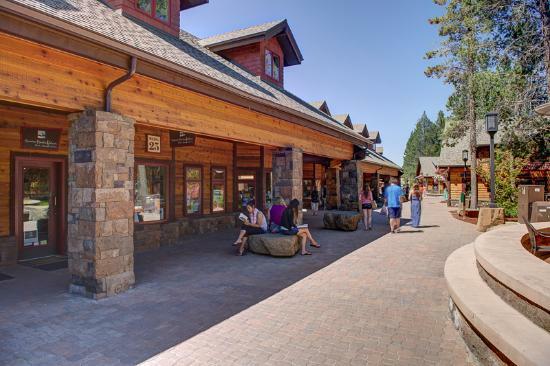 SUNRIVER, OR -- The Sunriver Service District met with Deschutes County Administrator Tom Anderson, Thursday, to discuss funneling some Transient Room Tax (TRT) dollars to the district. Currently, the district receives TRT funds indirectly, through the Central Oregon Visitors Association. District representatives say they struggle to provide services, especially during the summer months when tourists flood the area. Board Chairman Mark Murray tells KBND News, "We did an analysis to see what those costs really are, and if they really are affected by increases in tourism; and they are. So, we put together a short proposal and discussed whether we wanted to make an ask of the county to see if they would be interested - amenable; agreeable to appropriate some of the Transient Room Tax dollars directly to the service district." Murray says the district plans to officially ask the Deschutes County Budget Committee to share some of those TRT funds, later this month. "The primary source of our revenues is property taxes, but the growth in that source is limited. Given that, and the constraints we'll be up against in the future, we thought that we will be challenged to keep delivering the services that are needed out here." He plans to ask for $150,000 in ongoing TRT funds and a one-time expenditure of $300,000 for a planned fire and police training facility. BEND, OR -- National Nurses Week shines a light on the care giving front lines in the medical industry. 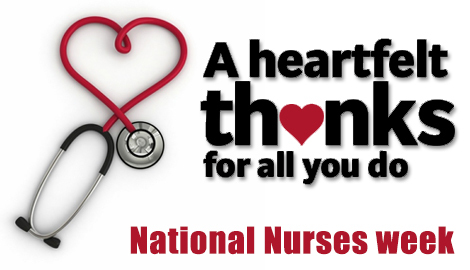 Nurses throughout the region were honored this week, which coincides with the birthday of Florence Nightingale, the founder of modern nursing. BEND, OR -- Voters have just a few more days to return ballots in time for Tuesday’s Primary. It’s too late to mail it, so you must get it into a drop site. 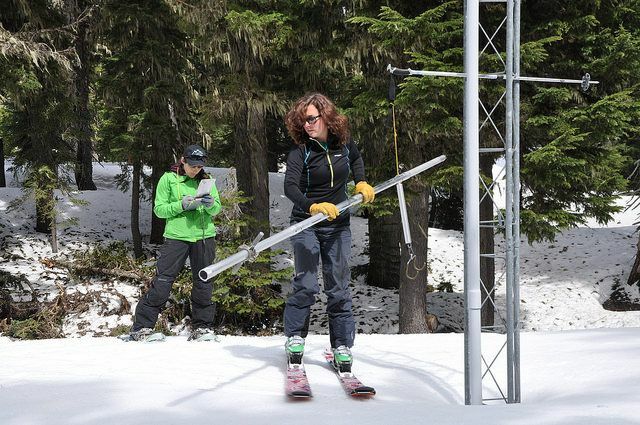 "We’ve got a new drop site on the west side of Bend. It’s in the Old Mill District above the cinemas, next to the Hilton Garden Inn. It’s in the parking lot on Bluff Drive," says Deschutes County Clerk Nancy Blankenship. "And, remember to sign the ballot. We’ve seen a lot of people getting excited about getting their ballots in and forgetting to sign. So, be sure to sign them and get them into a drop site; thank you very much." Click HERE for a full list of Deschutes County ballot drop sites. With Presidential candidate Donald Trump’s meeting with GOP leadership, Thursday, and his growing number of delegates, some Oregon voters have complained that their primary ballot won’t matter. But, Blankenship says registered Republicans are not required to vote for the front-runner. "Three candidates filed, three candidates are on the ballot; and so you should make your voice heard." Ballots must be signed, and in to an official drop site by 8 p.m., Tuesday, to be counted. CROOKED RIVER RANCH, OR -- Crooked River Ranch-area residents are concerned about the risks associated with living next to a wilderness area. Congressman Greg Walden (R-OR) wants to move the boundary of the wilderness area to help reduce the risk of wildfire. His plan calls for the boundary of the Whychus-Deschutes Wilderness Study Area to be moved farther away from the small community. It would allow a buffer between the Crooked River and the canyon. CRR resident Marilynne Keyser was part of a group that came up with several ideas for the management of those local public lands. She says moving the boundary was part of their discussions. 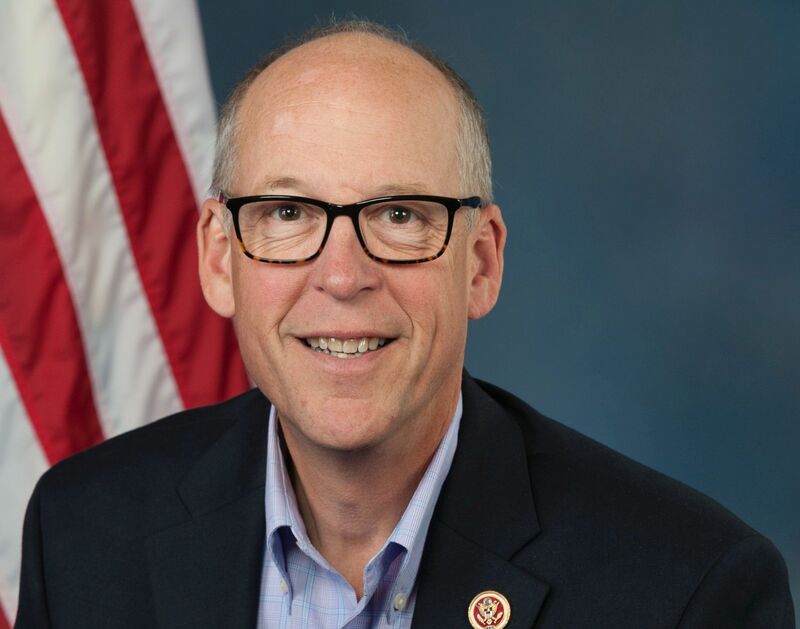 "Representative Walden has kind of run roughshod over what most of our Congressman are asking us to do, which is get the stakeholders together and work on a solution for your community. We were doing that, and he just moved in and pulled out one piece - the piece that had to do with taking land out of the wilderness area." Keyser tells KBND News she feels Walden's plan took just a piece of her group's idea dealing with fire concerns, instead of looking at the bigger picture. She says she supports the concept of Walden's legislation, but, "We want a balanced approach that will find solutions for everyone - not just for those of us who live at Crooked River Ranch and have concerns about fire, but for the thousands of people that use our public lands and want to protect the water, the wildlife, the native plants and permanent access for recreators." The Crooked River Ranch Fire chief testified before the U.S. House Natural Resources Committee, Thursday morning. Chief Richard Hoffmann was invited to brief the committee in support of Congressman Walden’s plan. EAGLE POINT, OR -- A last-minute move in March by State Senator Doug Whitsett has led to an unusual write-in campaign to decide his successor. District 28 includes Crook County and part of Deschutes County. Whitsett initially filed for reelection, but then announced he would retire at the end of his current term. Republican Dennis Linthicum filed minutes before the deadline. Write-in candidate and Eagle Point resident C.W. Smith says many voters aren’t happy with what they see as back-room political maneuvering. "Voters were denied the opportunity to have some choice. Rather than have a candidate hand-picked for them by the outgoing Senator, this write-in campaign gives voters some degree of choice of an alternative view, or a different ideology that I think is more compatible with the rural citizens who are, I think, for the most part, conservative." He says his top priorities are jobs, balancing natural resources policy and creating more transparency in decisions made for wilderness areas. Smith knows he faces an uphill battle. But, with the help of his political action committee, he thinks he’s got a chance. "The committee has been certified; that has made, to a degree, my candidacy legitimate. I’m not on the ballot, and I didn’t file in a timely manner to get a voters pamphlet statement. So, I need to make up for that. I’m doing a lot of traveling, I’m using a lot of radio and I’m using social media, extensively." The retired Jackson County Sheriff and former County Commissioner tells KBND News he's run eleven other successful campaigns. However, "This is probably one of the most interesting and challenging races I’ve ever run." Smith is a registered Republican; but says it's conceivable, as a write-in candidate, he could earn the nomination for either the Independent or Democratic parties, or both. Two others have also launched write-in campaigns, including Todd Kepple of Klamath Falls. 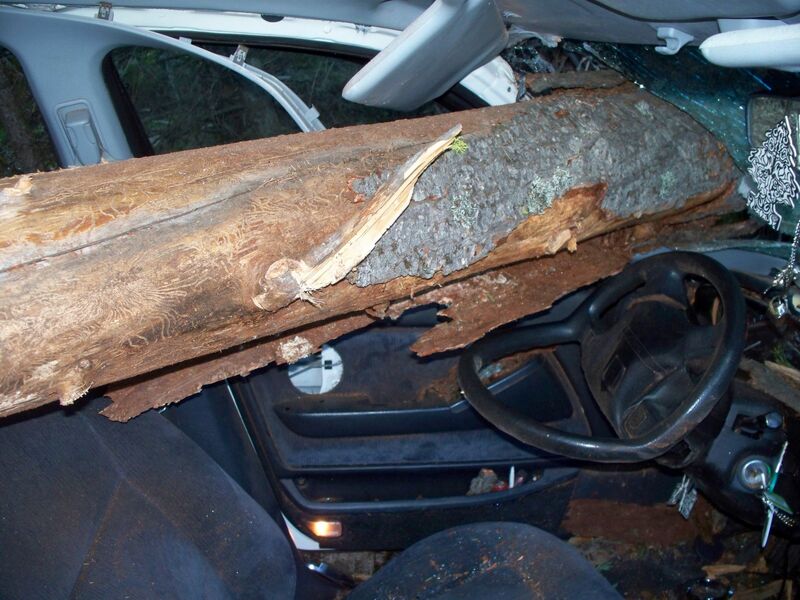 PRINEVILLE, OR -- One person was seriously hurt and another suffered minor injuries, in a crash the left their vehicle impaled by a large tree. Crook County deputies responded to the crash on a remote forest road 20 miles north of Prineville, just after 5 p.m. Wednesday. They say 20-year-old Kylian Beitz lost control of his car on Forest Service Road 27, went down an embankment and hit a downed tree - which came through the windshield. He was taken to St. Charles Prineville with serious injuries. 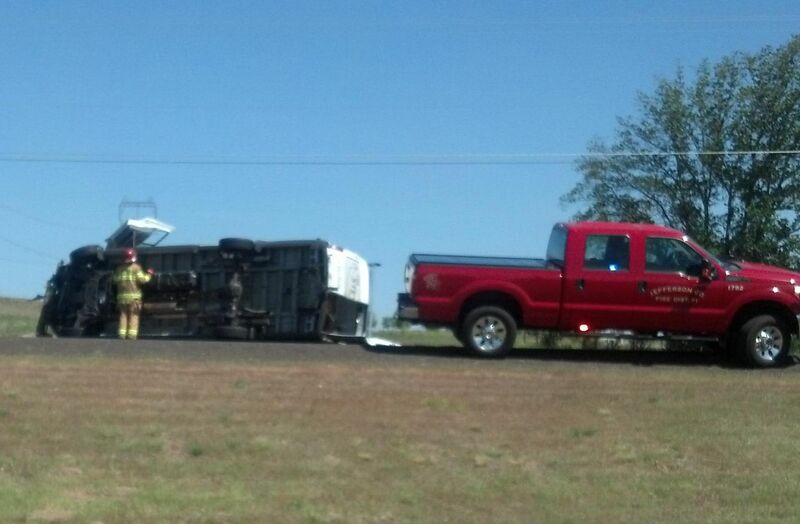 His 19-year-old passenger received minor injuries and refused medical treatment. Deputies continue to investigate the cause of the crash, but say alcohol, marijuana and speed may have been contributing factors. BEND, OR -- Deschutes County Commissioners unanimously voted to allow recreational marijuana grows in rural parts of the county. They delayed a vote on the controversial issue last December so they could study it more. But, after months of public hearings and deliberation, they voted Wednesday to opt in to allow these grows. Deschutes County Commissioner Tony DeBone said, "I don't see that it's going to help to bring it to a divisive vote of the people, at this point in time. Measure 91 passed in our county. The 'opt out' was given the opportunity for counties where it didn't pass by more than 55%. At this point, I'm supportive of rescinding the opt out and in putting reasonable regulations in place." Commissioner Tammy Baney added, "Many have thought that opting out means marijuana goes away in Deschutes County. If we had a nickel for every time we received an email saying 'protect our children by opting out,' I think there wouldn't be budget gaps in the state. But I think we have a responsibility to do what we can to find balance somewhere in the middle of a very divisive issue." Commissioner Alan Unger agreed, "I think we were elected to lead and this is our responsibility to lead; and that's what we're doing. We're making decisions and we're moving forward. I also think we realize that rural lifestyle in Deschutes County has been precious and people really have come here for that. But, it is also EFU land; and this state has a prescriptive way of protecting Exclusive Farm Use land, and we here have bumped up against it on numerous things that we have done." Unger added, "And we'll adjust. If we see there are issues, we'll adjust. We're trying to do some kind of good neighbor so responsible people on both sides can live with each other and move forward. And, in some ways, we're now kind of allowing our rural land to be mixed stages." The grows won't be allowed until later this year when Commissioners have mapped out and adopted regulations. BEND, OR -- Mt. Bachelor's parent company, Powdr, has named a permanent general manager for the resort. John McLeod took over as interim GM in March and has been appointed to the permanent post. Powdr announced "leadership changes" at the ski hill a month ago, which included the departure of the previous president and GM, David Rathbun, after eight years at the helm. McLeod has been with the resort off and on since 2005; most recently as the Director of Finance and Business Development. Sisters to Release Report on Former City Mgr. SISTERS, OR -- The city of Sisters will release its report on former city manager Andrew Gorayeb. Several media outlets filed public records requests for it, but were denied. They appealed to Deschutes County District Attorney John Hummel and he has now ruled the report will be made public. Sisters Mayor Chris Frye tells KBND News he will obey the law. "For me, it was not a want or how I felt. It was what does the law require. People giving the council legal advice said we didn't have to release it because it was disciplinary action that occurred, and that was a part of his personnel file. We were told if we would release it we would put the city in legal jeopardy." Frye says some councilors didn't want to release the report because they believed criticism of current city employees in the report may hurt morale, but Frye says he followed legal council to avoid future litigation. "I'm sure there is some sensitive information in the report when people read it. But I've been so impressed with the professionalism with our city staff over the last couple months -- what they've been through. Will there be some hard things in there? Sure. Will they get through it? Absolutely." BEND, OR -- Drivers may have noticed a lack of dedicated traffic patrols by Bend Police, in recent months. Chief Jim Porter says the Traffic Division disbanded in October, due to an ongoing shortage of qualified officers. "I literally had to take my six-person Traffic Unit, strip all those officers out of the Traffic Division so they can train new officers and they can respond to emergency calls. I’m slotted for six positions in Traffic and we would love to get back to there, as soon as we get enough officers to respond to emergency calls." But, that doesn't mean nobody is writing tickets. "So every officer, when he’s going from point A to point B on calls, does do traffic enforcement," Chief Porter tells KBND News. 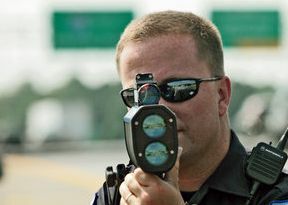 "As a matter of fact, we’re preparing to purchase five new moving radars for our standard patrol officers, so they can do that traffic enforcement as they roll across the city, until we get our traffic team back up." Porter has six officers currently in various stages of training, and another seven openings waiting to be filled. Click HERE for our full conversation with Chief Jim Porter, or visit our Podcast page. BEND, OR -- Five local nonprofits competed for a $10,000 prize at the Central Oregon Impact Summit. Tuesday night's event was held at the Riverhouse Convention Center, organized by the latest Leadership Bend class. Jacob Fain, with Leadership Bend, says the project serves a community need. "Our real vision is, we want to be able to elevate the nonprofit community here, in Central Oregon. And, some of the hard skills that a lot of the organizations got had to do with managing effective boards, being able to get out and tell their story and really promote what their mission is. I think, at the end of the day, a lot of nonprofits really struggle with that part, and that's really tied to the dollars; and the dollars are what help move their mission forward." The class selected five organizations to compete for the grant: The Deschutes Children's Foundation, Healthy Beginnings, High Desert Food and Farm, La Pine Community Kitchen and Treehouse Therapies. "We then started looking at their mission, their impact," Fain tells KBND News. "We were looking for some really tangible results, but also looking where are these nonprofits at currently, and what do they need to take it to the next level. And, the organizations that best were able to describe what they needed to take their mission to the next level were the ones that made it to the top five for the opportunity to compete for $10,000." 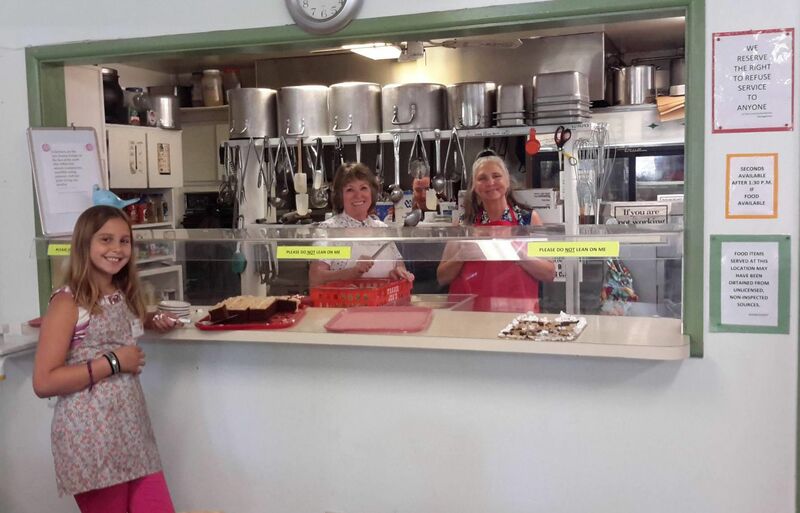 In the end, La Pine Community Kitchen was awarded the top prize. "Our utility bills are $10,000 a year, so it will provide the electricity, the gas and the water that we need to operate, in order to help the 3,000 people we serve every single year," Executive Director Kim Hafermalz said in a statement. "I am excited and thrilled. Now I can pay these critical expenses." Hafermalz adds, "To win this prize means that Bend and the bigger world, as we see it, say, 'yes, this is good and we support you.' It's life changing." BEND, OR -- Bend Parks and Recreation is extending free recreation opportunities at The Pavilion through June 18, in an effort to increase usage of the new covered facility off Southwest Simpson Avenue. Free play sessions are offered Monday through Saturday, and include basketball, pickleball, indoor soccer and croquet. "This spring is unique as The Pavilion is not as heavily scheduled with programs as it will be this summer and beyond," Director of Recreation Matt Mercer said in a statement. 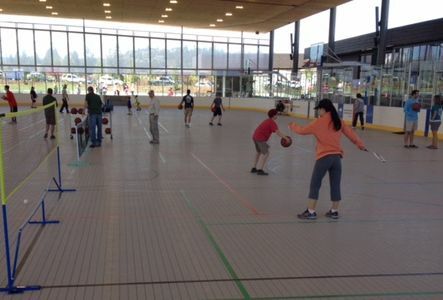 "It was the fist time the facility transitioned from an ice rink to sport courts and there were a number of variables that we needed to carefully plan around. The transition went smoothly and the facility is available for the community to enjoy before summer programs begin." Schedules and additional information is available at the Parks and Rec website, or by calling 541-389-7588. The Pavilion is located at 1001 SW Bradbury Way. SISTERS, OR -- Deschutes County Sheriff's detectives helped the Central Oregon Drug Enforcement (CODE) Team arrest a La Pine-area man on methamphetamine related charges. Investigators believe the suspect would travel from the Willamette Valley to Deschutes County to sell the drugs. Deputies stopped 66-year-old James Worden on Highway 20 near Sisters, at 4 a.m. Tuesday. They say he had meth, packaging materials and digital scales with him at the time of his arrest. Worden faces a number of charges, including Unlawful Manufacture of Meth. PRINEVILLE, OR -- The three candidates for Crook County Judge will take part in a candidate forum, Tuesday evening. 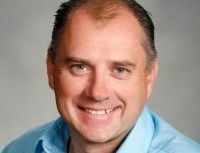 County Commissioner Seth Crawford is running against fellow Commissioner Ken Fahlgren and former Chair of the Central Oregon Patriots Craig Brookhart. Crawford expects to discuss the same topics that voters have told him are top priorities, including jobs and the budget. "Long-term budget planning is something I’ve been talking to them about. When I talk with them and tell them, the fact that we don’t do long-term budget planning at the city, that’s something that rises to the top really quickly with them." Crawford tells KBND News building a new Crook County Jail is also an important issue. "The Jail Committee came out with a proposal that I think is a great proposal; it’s been vetted through quite a few people in our community. To me, the next step is to find out what the people of Crook County are willing to pay for a jail, and then figure out what we can provide for that amount of money." Click HERE to listen to our full conversation with Seth Crawford. Craig Brookhart agrees with the need for a jail, but says delays in moving forward with a plan are a symptom of what he calls an underlying lack of leadership. "I talked about it in 2012 and suggested we needed a long-term strategy; we needed a way to save the millions of dollars we were spending. Here we are four years later, and we just now got done with a Jail Committee to try and come up with a long-term solution." He hopes his position as a government outsider will help elevate him at the polls. He says it's time for a change. "If you talk to people inside County Government, they’ll tell you a lot of them are frustrated. They feel like the management aspect of that is just not happening for them. They’ve told me that oftentimes one department doesn’t know what another department is doing." 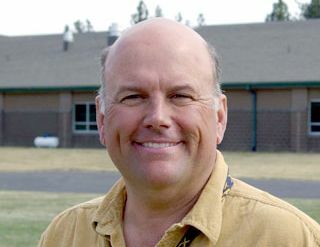 Brookhart stepped down as Chair of the Central Oregon Patriots to run against Crawford and Fahlgren. He says, "A lot of people don’t know what’s going on and they don’t have a voice in what’s going on. I am very big on transparent government and I like to keep people informed. Our communications could be so much better." Ken Fahlgren was not available for an interview Monday, due to his participation in a Leage of Oregon Counties meeting in Salem. If one candidate receives more than 50% of the vote on May 17, the position is decided. If no one gets more than 50%, the top two face each other again, in the November general election. Tuesday's forum is hosted by the Prineville/Crook County Chamber of Commerce. It begins at 6:30 p.m., at Carey Foster Hall at the Crook County Fairgrounds. BEND, OR -- Deschutes County Commissioners continued to deliberate for three and a half more hours, Monday, but failed to make a final decision on whether commercial marijuana operations will be allowed in rural areas. They will continue the discussion at their 10 a.m. meeting, Wednesday. Monday afternoon, Commissioners considered rules for which zones would be allowed to grow cannabis. County Commissioner Tony DeBone wants to limit marijuana operations to Exclusive Farm Use (EFU), for now. "As a starting point on a narrow path, EFU would be a place that would be a good starting point, so I'm not really motivated to include MUA at this point. I think of a recreational adult-use production is going to be more of a business and a high-value crop. And, Multiple Use Agriculture [MUA], I see, is that lifestyle - a couple horses on a small property - type of thing." Commissioner Alan Unger would like to restrict processing operations more than grows. "I'm looking at trying to control processing by limiting size, somehow. So, that we aren't looking at big operations with industrial and lots of people coming to work there. Farming is farming and you should be doing crops; you shouldn't be doing industrial processing. So, how do we allow for small operations that have little impact, versus big operations that have a lot of impact." County Administrator Tom Anderson advised them to add guidelines for consequences if applicants fail inspections. "You might consider including in that language, the 'what if' if they fail the annual inspection. That provides some certainty to both the applicant as well as neighbors, as to what that means. It could be something as simple as 'failure of the annual inspection will result in code enforcement,' all the way up to 'if not corrected in X-number of days shall result in a fine of some kind.'" Commissioners say they hope to reach a decision Wednesday on whether to opt in and implement regulations, or continue the ban and let voters decide in November. REDMOND, OR -- Redmond’s new fully accessible playground at Sam Johnson Park is very popular, often filled with kids, regardless of the weather. But, Parks Division Manager Annie McVay says Hope Playground will close for five days next week. "I think everyone will be disappointed, but I think everybody understands that we need to get in there and repair a few things – primarily the flooring. And the way it works is, if you walk on it at any part during that, it’ll impact the way it cures." 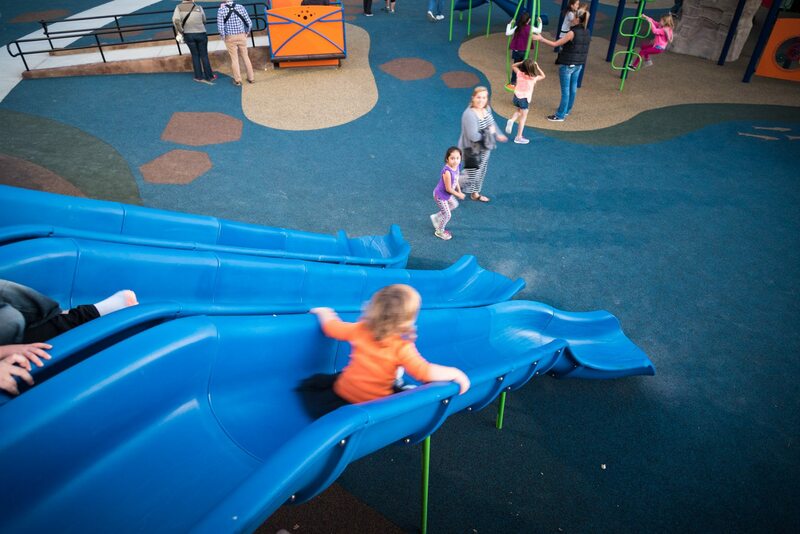 Read more about Hope Playground's October opening. She tells KBND News cracks were expected, given the flooring material was installed in the fall. "For the product to cure best, it’s best not to have big temperature swings. But, this being Central Oregon, we were up in the 80s during the day and almost freezing at night. So, they knew when they were pouring it, it wasn’t ideal conditions and there would be some extra cracking." McVay says officials are still figuring out the maintenance needs of the playground's unique features. "We’re learning that if something has a moving part, it’s probably going to break. But, we’ve had really great experiences with everything out there. We’ve had some issues with the zipline, but we’re getting that dialed in and up and running more often." Flooring repairs are covered by the warranty. The closure should be limited to Monday through Friday of next week, weather permitting. Fundraising efforts continue to bring a merry-go-round to Hope Playground. A matching $24,000 donation has slashed the city's obligation in half. So far, a Go Fund Me page created by the Redmond Kiwanis Club has raised a little over $400. 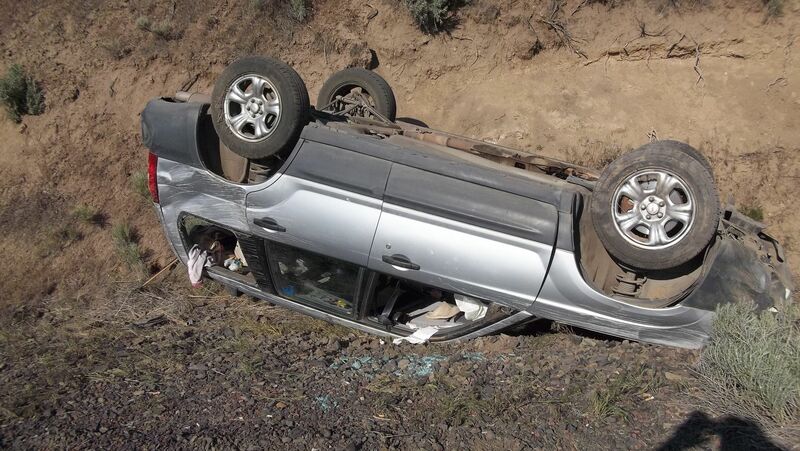 TERREBONNE, OR -- One person suffered minor injuries in a rollover crash west of Terrebonne, Monday evening. Deschutes County deputies found the SUV on its top just after 5:30 p.m., near the intersection of Almeter and Sedgewick avenues. They say Isaac Erickson lost control while driving northbound through a series of sharp curves. Witnesses say he was not speeding and there is no indication of drug or alcohol use. 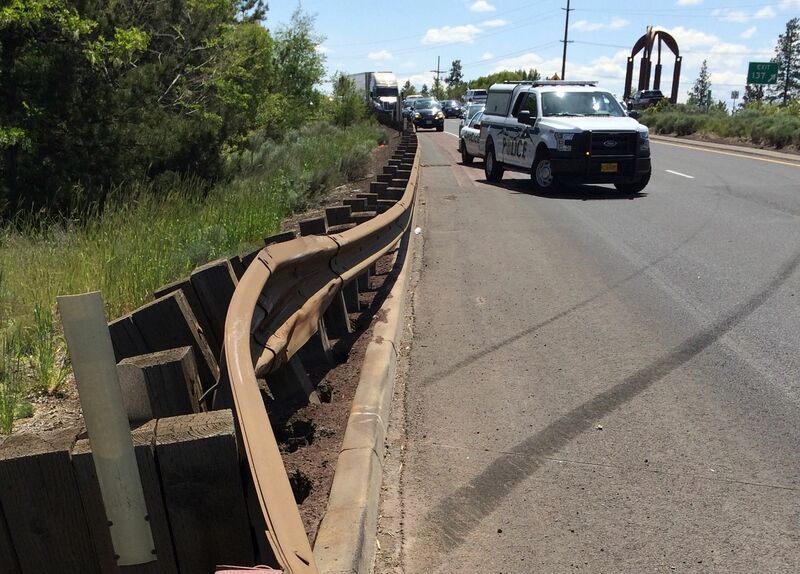 Erickson told deputies he got too close to the edge of the roadway and overcorrected. BEND, OR -- There are 34 U.S. Senate seats up for grabs, this year; ten are currently held by Democrats, including Oregon Senator Ron Wyden. Four Republicans each hope to take on Wyden in November. One candidate for the GOP nomination, Bend businessman Sam Carpenter, says the race has garnered national attention because of the possibility that a senior Democrat could lose his seat. He tells KBND News, "When the Democrats were in charge, he was Chairman of the Senate Finance Committee, Chairman of the Natural Resources Committee; this will be a big deal. A lot of the, OK, pundits, a lot of the establishment thinks it’s a lock for Ron Wyden, and actually, it’s not." Carpenter adds, "This isn’t a long-shot or a lightning strike; there’s so much in favor of him being retired. And, that’s not just braggadocio on my part, that’s a fact if you look at the numbers and you look at what’s going on in this cycle, and the things that have changed, exemplified by Donald Trump’s success." Wyden spent 15 years in the U.S. House before he was elected to the Senate in 1996. "There’s a lot of people that want to see people change," says Carpenter. "They don’t want to talk about it anymore; which is what the establishment on both sides of the aisle does, they talk, talk, talk. Hey, let’s get the job done." Carpenter faces Portland IT specialist Mark Callahan, Lane County Commissioner Faye Stewart and Portland Finance Consultant Dan Laschober in the Republican Primary. But, he says he's optimistic of his chances. To hear our full conversation with Sam Carpenter, click HERE or visit our Podcast page. 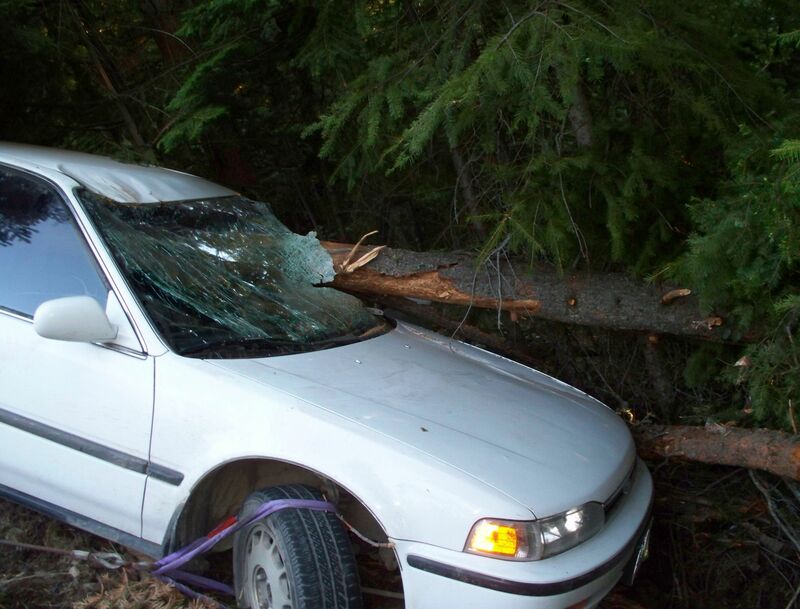 LOWELL, OR -- A La Pine woman was injured in a crash southeast of Eugene, Monday morning. Oregon State Police troopers responded to the single-vehicle accident on Highway 58 east of Lowell, at about 6:45 a.m.
Investigators believe 24-year-old Jessie Shader was eastbound when her SUV left the highway for an unknown reason. They say she was able to get out of the car before it caught fire. Shader was taken to the hospital with minor injuries. The investigation is ongoing. BEND, OR -- Deschutes County Commissioners continue deliberations Monday, on whether or not to allow commercial marijuana grow operations in rural areas. Discussions between the three Commissioners began Wednesday, with potential regulations for lighting, odor and setbacks for grows. Sheriff Shane Nelson has told Commissioners in the past that he wants voters to decide whether they should be allowed. He reiterated his feelings at last week's League of Women Voters Candidate Forum. "Sheriff's Office resources will be affected by that. We know that calls for service will increase in that arena. And, I want the citizens to tell me if it's OK with them that the Sheriff's Office resources will be affected by that; and that's why I want it to go to a vote." His challenger, Deputy Eric Kozowski, says it's not the Sheriff's decision. "Number one, it's not up to me to decide which regulations; that's the job of County Commissioners, the State Legislature and the OLCC. I live on EFU [Exclusive Farm Use] property east of Bend. I potentially could be impacted by this, so I fully understand the concerns of rural residents. Regardless of what the law is, it is our job to uphold the law." So far, Commissioners have agreed grow operations should be set back 100 feet from a property line and 300 feet from a home. They've also said bright lights should be forbidden between 7 p.m. and 7 a.m. They could make a final decision during the 1:30 p.m. work session and allow the operations with regulations or continue to opt out and send it to voters in November. BEND, OR -- A Powell Butte woman was killed when her vehicle rolled several times near the Bend Airport, early Saturday morning. Samantha Goodew’s SUV was discovered on its top about 20 yards from the Powell Butte Highway, just before 5 a.m.
Investigators are unsure exactly how or when it happened, but say the 25-year-old woman may have been on her way home from work between and 3 a.m. and 4 a.m., Saturday. They continue to look at a number of possible reasons for the crash. BEND, OR -- The FBI arrested a man who had been an embedded reporter during the occupation of the Malheur National Wildlife Refuge. Michael Emry was taken into custody Friday on weapons charges. He runs a website called “The Voice of Idaho,” and was associated with the "3 Percenters" - a group that sympathized with and supported the militia during the Harney County standoff. Emry had recently moved from Idaho to John Day. During a search of his trailer, the FBI seized a 50-caliber machine gun capable of firing more than 550 rounds per minute. The serial number had been removed from the gun. 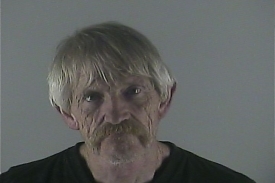 He’s being held at the Deschutes County Jail. 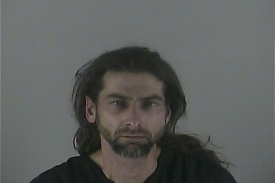 Emry is scheduled to appear in a Eugene federal courtroom, Monday. LA PINE, OR -- The Deschutes County Sheriff’s Office will provide free document shredding in La Pine, Saturday. Kyle Frick says Mid-Oregon Credit Union is helping with the event, in an effort to prevent identity theft and fraud. "We had been doing our free shed events right after April 15th for years, at our branches in Bend, Redmond, Prineville, Madras. We didn’t have one in La Pine, and then we saw that the Sheriff was doing theirs. So, we’re partnering them to provide this free shred." There is no cost for up to four medium-sized boxes of personal documents, per person. Frick tells KBND News, "They also do disposal of prescription drugs, and they’re doing a food drive for the La Pine Community Kitchen. So, we just try to help out and share, and do that with them so we can actually bring that service to La Pine and be part of that." Shredding equipment can destroy paperwork with staples or paperclips, along with binders and folders, so there's no need to pre-sort. The Free Shred event is from 11 a.m. to 1 p.m., at the Sheriff’s Department substation in La Pine. Click HERE for more details. SISTERS, OR -- Sisters City Councilor are expected to name an Interim City Manager, Friday. Councilor David Asson tells KBND News they have a good pool of applicants to choose from. "We had three people apply - two by telephone and one by person. Each had qualities for being an interim manager and they all had an interest in Sisters." One of those candidates, he says, is current Interim La Pine City Manager Rick Allen. Those three candidates were interviewed by the Council on Thursday. Asson says they'll meet again Friday morning to make a final decision. "They'll be a new meeting by Council to discuss our feelings on the three. And, likely one of those will be chosen to be an interim manager. Probably to work three months, maybe more, taking care of business as it goes along, but also helping us to locate and hire a permanent manager." Former City Manager Andrew Gorayeb resigned last week after two months on paid administrative leave. 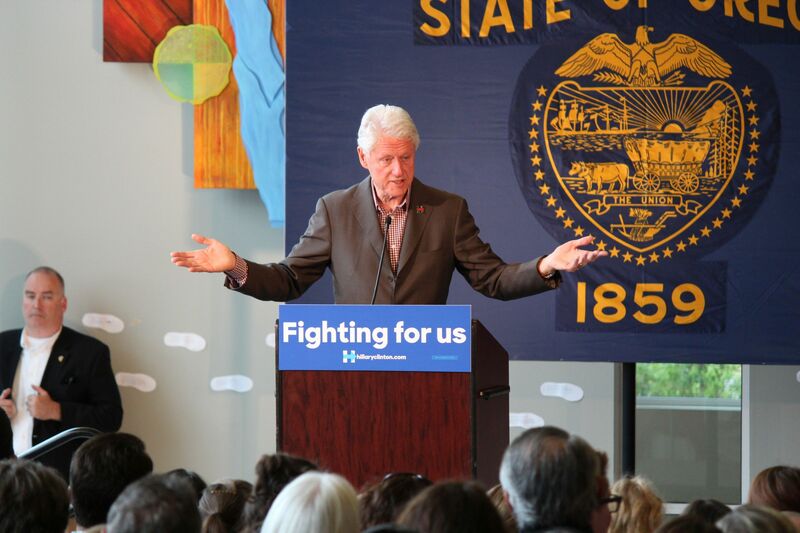 BEND, OR -- President Bill Clinton delivered a passionate speech Thursday at Central Oregon Community College. About a thousand people packed into the Coats Campus Center to hear his speech in support of his wife and Democratic Presidential front-runner Hillary Clinton. Some hoping to hear the former President were turned away due to the crowds. He told supporters she is well equipped to handle the country's challenges. "All these countries that the United States helped to liberate in the long Cold War are deciding that maybe Democracy is too much trouble. They just want a strong leader in the mold of Mr. Putin and keep the foreigners out. Britain’s thinking about withdrawing from the EU. All these things could effect us. You cannot afford to have a President go in there who does not have the confidence of world leaders, the trust of world leaders, and who understands how to keep big bad things from happening and make good thing happen. We cannot afford it." Clinton promised Hillary would restore the dwindling middle class. "The great task today, is to create a shared prosperity; that is shared, not only among all Americans, but with the future, that is sustainable. To do it, we have to raise middle class incomes, restore upward mobility for everybody and put the pedal to the metal on the things that will work for us in the future." During his hour-long speech, he tried to explain why his wife would make a better President than Republican rival Donald Trump. "This has been a rather interesting year, wouldn’t you say? I do believe that love trumps hate; I do believe that. But, I think it’s important to understand why there’s been so much intensity in both primaries and so much true believing and ‘we got to throw all the system out.’ It’s because, in 400 years, not a single country has fully recovered from a crash as severe as the one we endured, in less than 10 years." At one point, Clinton stopped his speech when he noticed a man in the front row had fainted. The audience member regained consciousness and was fine. Following the Bend appearance, Clinton traveled to Portland for a couple of speeches. The COBA Home and Garden Show takes place at the Deschutes County Expo Center in Redmond, Friday through Sunday. EUGENE, OR -- Donald Trump will host his first Oregon campaign rally Friday evening, in Eugene. 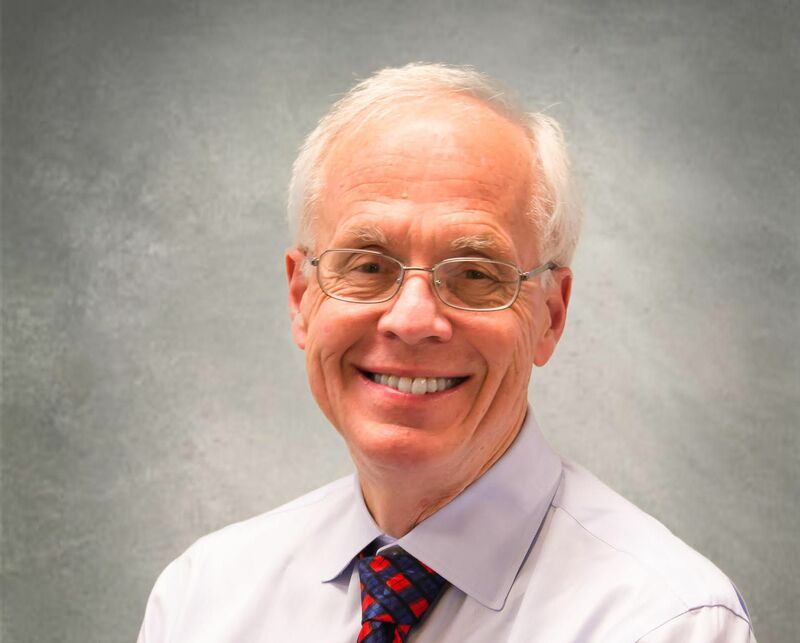 Bend businessman and candidate for U.S. Senate Sam Carpenter announced his endorsement for the presumptive Republican Presidential nominee, last week. He plans to attend the rally. "We’re going to have a private meeting, and that’ll be fun. That’ll be the first time I’ve met him." He tells KBND News the Trump campaign requested the meeting. Carpenter faces three other Republicans in the May Primary. He believes Oregon's race for the GOP nomination has caught national attention because of the potential gains for the party if high-ranking Democratic Senator Ron Wyden were to lose his seat. Carpenter says appearing in a liberal community, like Eugene, is a bold move for Trump. "We entrepreneurs, the successful entrepreneurs get right down into it and get into the belly of the beast, and that’s what he’s doing. I love this gesture of coming to Eugene. If you’re going to solve a problem, you’ve got to get into the middle of what it’s all about and you don’t dilly-dally around, and you don’t talk; you take care of it." Eugene Police are preparing for what could be large demonstrations against Trump. Chief Pete Kerns says they're learning from what's happened at past Trump events. "Without any question, there is some violence tied to these rallies. We’ve seen what’s occurred in other cities, we know how police departments have prepared for those and how it’s gone for them." Several nearby police agencies are helping, along with Portland and Oregon State Police. Chief Kerns says local governments pay the costs for these events. "It’s an unanticipated expense, and we keep room in our spending in order to afford this kind of thing." He says those attending the rally will go through heavy security and should arrive early to account for anticipated long lines. Admission to the Lane Events Center is reportedly on a first-come, first-serve basis, up to 5,000 people. 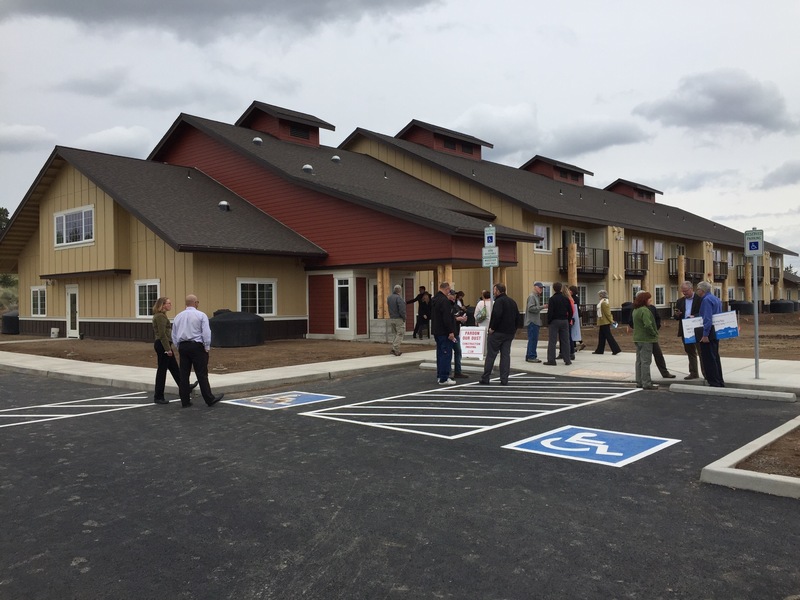 Trump is scheduled to speak at 7 p.m.
PRINEVILLE, OR -- Prineville’s newest affordable housing complex celebrated its grand opening, Thursday morning. John Gilbert, with Pacific Crest Affordable Housing, says construction of Iron Horse Lodge is nearly complete. "We’re offering rents that are going to be affordable to low-income households. Ages are restricted to 55 and older. We’re going to have 26 apartments that we rent; the Department of Health and Human Services is also going to be putting some of their clients into the building." Rents are considered affordable for households earning 30%-50% of the Area Median Income for Crook County. The complex is comprised of 22 one-bedroom units and four two-bedroom units. Gilbert tells KBND News those 26 apartments are already spoken for. "The need is actually more than what we expected it to be. But, we’re also not surprised that we’re fully leased up before completing construction." He says based on that demand, a waiting list has already started for an anticipated phase two. "We’re offering a very environmentally sustainable building," Gilbert says. "The amount of energy the building will be using to house the 30 or so occupants will be way below what the code requires." 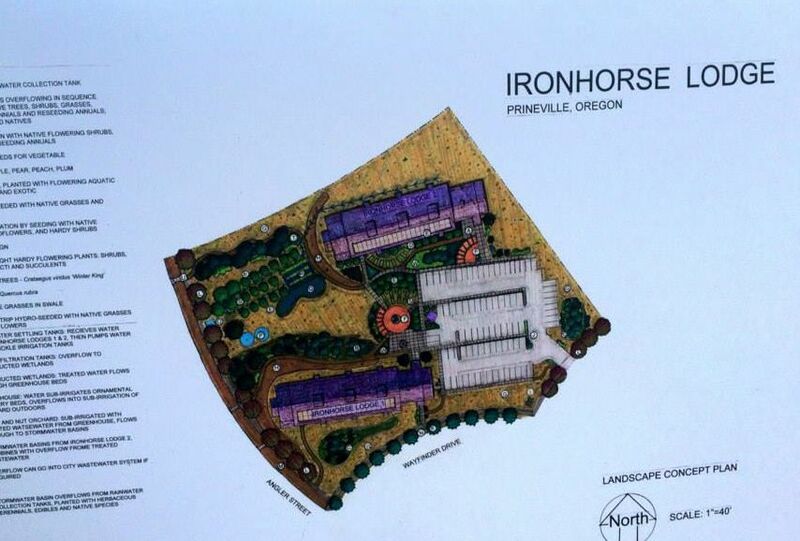 Iron Horse Lodge is on Wayfinder Drive, northeast of downtown Prineville. BEND, OR -- Republican Gubernatorial candidate Dr. Bud Pierce made a campaign swing through Bend, Wednesday. Pierce tells KBND News visits to the various regions of the state are an important part of his campaign, ahead of the May 17 primary. "You have to meet the people; you have to hear their message. And, I’m actually firmly convinced, if I’m successfully elected as Governor, I need to do the same as Governor. You need to be out there, hear the stories in an unfiltered, unvarnished way." He met with veterans in Bend, toured the Central Oregon Veteran’s Ranch and spoke to the Sunriver Republican Women’s Group. Dr. Pierce says getting Oregonians into meaningful employment is one of his top priorities. "While we report that we have a low unemployment rate, it’s a low unemployment rate among the people that are being counted. There are so many people living on the streets, the mentally ill in prisons and other people we just don’t count anymore. We need to bring those people back in because the social cost and the moral cost of seeing that failure on a day to day basis is really grinding at us, and is really harming our state." The Salem oncologist has never served in elected office before. He's running against Bruce Cuff, Bob Niemeyer and Allen Alley for the GOP nomination. Pierce admits Alley, a Lake Oswego businessman and former chair of the Oregon Republican Party, is his leading opposition. "It’s exciting. I think that competition brings out the best in people. It allows people to define themselves and their opposition in more precise ways. I think it’s good for the citizens because citizens like competitive political races; and when it’s one-sided, there’s no competition they really tune it out." He says he's already looking forward to facing Governor Kate Brown in the general election. But, he’s already looking ahead to facing Kate Brown in the general election. "It’s going to be about, number 1: public safety. And, the issue there is getting the homeless off the streets, getting them to shelter and recovery, and getting them to be productive citizens; and dealing with that mental health issue that’s bedeviling us with half our prisoners in jail that have mental health issues, 70% of juveniles and a lot of homeless people. Second, is that drive to get to real, full employment." BEND, OR -- The two candidates for Deschutes County Sheriff squared off at their first forum, hosted by the League of Women Voters, Wednesday night. Deputy Eric Kozowski is running against current Sheriff Shane Nelson. Kozowski pointed to recent high-profile departures by two captains for misconduct as reasons for change. "The Sheriff’s Office has some serious problems. These problems not only impact your wallet but your safety. Continual mismanagement and leadership failures have caused these problems." He told the crowd, "It’s unfortunate we’ve had these issues that have distracted us from our ability to protect and serve the community. I think a lot of it comes down to lack of leadership, lack of oversight. Sheriff Nelson responded. "Of course we’ve had two captains fall while I’ve been your Sheriff and I don’t take that lightly. But, what I hope that you see is how I reacted to that and how your Sheriff’s office maintains its excellent, superior public safety and service in the aftermath of that." He added, "We employ human beings – you can’t take the “human” out of human being, nor would we want to. It’s why we’re good at what we do. It’s what we do in response to those missteps and those mistakes and I hope you know we’ll take care of business." Kozowski has been a deputy with the Deschutes County Sheriff's Department for six years, and was a deputy in Wallowa County prior to moving to Central Oregon. Sheriff Nelson has been with the department 22 years and served as Corrections Division Captain prior to being appointed Sheriff last year. Because there are only two candidates, the race will be decided in November. BEND, OR -- A day before the Bend City Council was to vote on the request to change the status of Troy Field to allow the property to be sold, the Bend-La Pine School District withdrew the application. The school district agreed to sell the property to a developer for $1.9 million, to help finance new schools and maintenance. But, The sale was contingent on removing the ‘public facilities’ designation from Troy Field. The withdrawal of the request leaves the future of the open space up in the air. 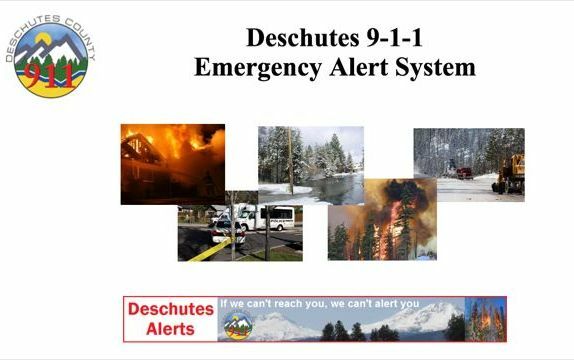 BEND, OR -- Deschutes County has launched a new emergency notification system, in a partnership with Crook, Jefferson and three other eastern Oregon counties. 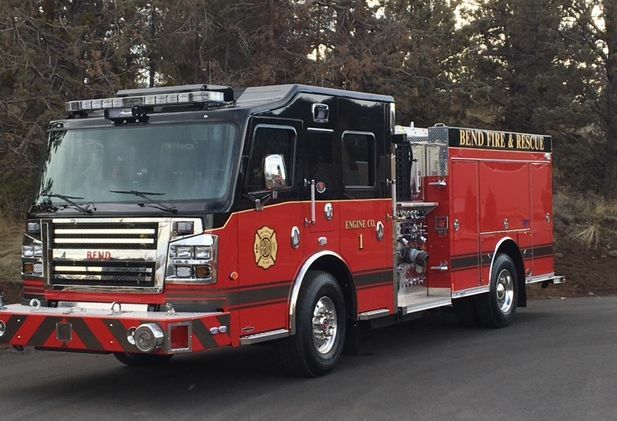 Deschutes County Emergency Manager Nathan Garibay tells KBND News, "It really can deliver important notifications, emergency notifications, to our citizens in the event of a critical incident such as a wildland fire, hazardous materials leak or some other event like that." It can also be used by law enforcement agencies to notify off-duty officers of emergency situations. Garibay says the new system, run by EverBridge, replaces a previous one that primarily operated through landlines. "This also includes cell phones, emails, text messaging, a number of different contact paths – up to 10 actual contact paths that citizens can be notified by." And, he says it's designed to be easier to use, faster at alerting the public and more comprehensive than previous systems. "People can register themselves if they have certain special needs, that the last system didn’t have the ability to do, so that we might be able to screen some of those folks and identify them and send them a message sooner, if possible. It’ll really help us deliver a better service to our citizens." Crook County launched its system in December, and Jefferson County's came online just a few weeks ago. Garibay says by partnering with five counties, also including Gilliam, Sherman and Wheeler counties, they were able to negotiate a better contract with EverBridge. Deschutes County residents can sign up HERE. Jefferson County residents, click HERE to register. And, Crook County residents sign up HERE. 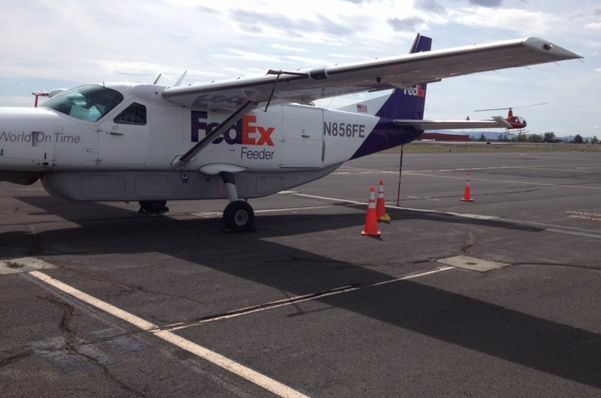 He says hangar space and tie-downs were already limited in Bend. Many private pilots pre-arranged to move their planes to the Bend Airport prior to the closure. “These are people who are picking up, but a lot of them are transients that would normally be going into Redmond just bringing people in and dropping them off. They don’t have an alternative right now so they’re going to be bringing them in to Bend until Redmond gets opened up again.” Among the new aircraft at the Bend Airport is a huge Chinook military helicopter. Roberts Field is scheduled to reopen in about three weeks. BEND, OR -- The President of Oregon State University called for an infusion of state funds for OSU-Cascades, during his State of the University address delivered at the Riverhouse Convention Center in Bend, Tuesday evening. Ed Ray says the new Bend campus must be a statewide priority. He told the crowd, "[There is a] need for the Higher Education Commissioner, the Governor, the Legislature to have a serious conversation about what can be done to provide capital support for the Cascades campus." 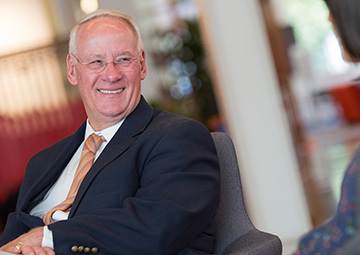 President Ray says, "We need to continue the process of investing in OSU Cascades, if it’s to realize its promise of having a campus of 3,000 to 5,000 students around 2025." For the next biennium, OSU-Cascades has requested 69 million in state bonding for the next phase of its expansion." To do that, he says, "We need $150-$250 million over the next 10 years. So, what we’re asking for in the ’17-19 biennium is the 9.5 million for the land reclamation, another 11 million for infrastructure purposes, another 39 million to have the second academic building." He also announced last night, the first academic building on the new campus will be called "Tykeson Hall," after the Tykeson Family Foundation that donated a million dollars to launch the first OSU-Cascades capital campaign. The foundation recently committed an additional one million toward the next phase of the expansion. BEND, OR -- While conditions may be just right for controlled burns, this week, many Central Oregonians don’t find the smoke all that "favorable." Jean Nelson Dean, with the Deschutes National Forest, says while hazy skies are an inconvenience, the burns are necessary. 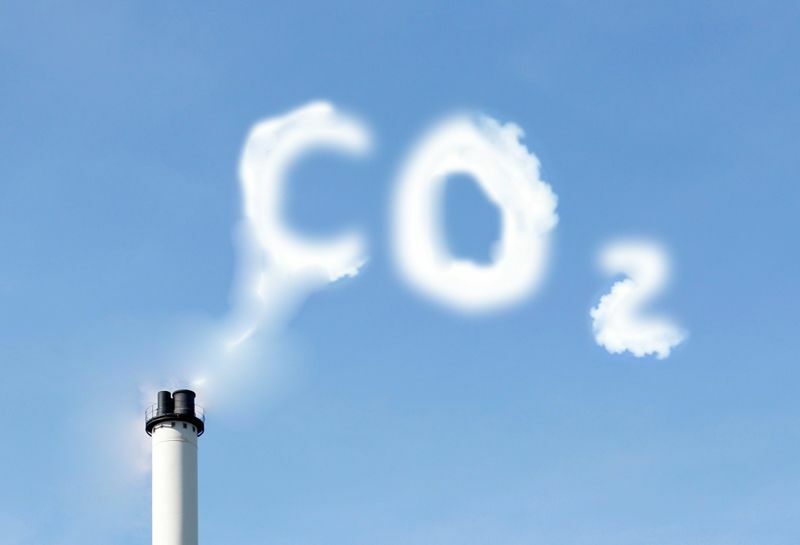 "I think all of us who do this work, we certainly understand that it isn’t pleasant – especially for those people with certain conditions – asthma and some breathing conditions. We do have a map where people can see where our prescribed burns in the hope that people will know the situation at the time. We always encourage people, close your windows at night, especially when we’re having burns really close to town." She tells KBND News they carefully watch weather conditions to make sure winds will carry smoke away from populated areas during burns. "We are constantly monitoring throughout a burn. The reality is, we’re going to have smoke; if we’re going to live in a fire-adapted ecosystem, there’s going to be smoke. It’s just a matter of how much smoke there is." And, Nelson Dean says despite those best efforts, hazy skies are often unavoidable. "Prime time is to burn in Spring, because that’s when we have the fuel conditions that we want to burn- winds and all of those things. We can’t burn in the summer and we can’t burn in the winter. In spring, we also have those conditions, you’re cooling the air in the evening and bringing that smoke back down. There’s not a really a perfect, perfect scenario when there’s no smoke." 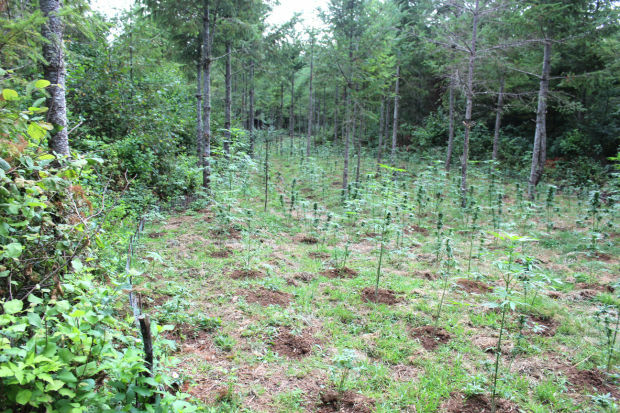 FOSSIL, OR -- The Central Oregon Drug Enforcement Team helped bust an illegal outdoor marijuana grow with over 8,000 plants in southern Wheeler County. The grow was discovered by a Wheeler County resident who immediately reported it to the Sheriff’s Office. 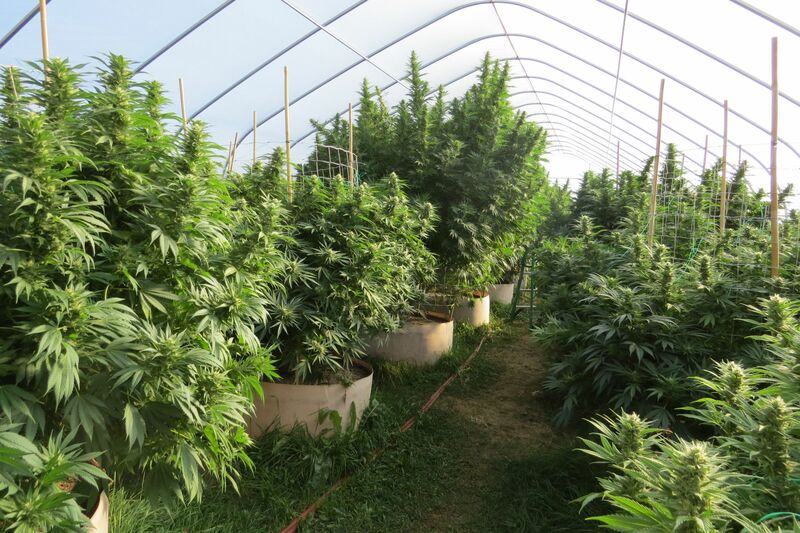 Drug detectives say things like propane tanks, large amounts of black irrigation piping and fertilizer bags may be signs of an illegal grow operation. This week’s bust was a joint effort by the Wheeler County Sheriff’s Office, CODE and Oregon State Police. BEND, OR -- A local high school was recently ranked among the top in the state. 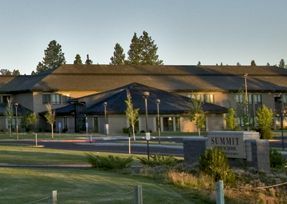 U.S. News and World Report named Summit High the 11th best public high school in Oregon. Click HERE to view the full state ranking from U.S. News and World Report. Summit High has ranked in the top-20 before, but never as high as number 11. It was also the highest ranked school outside of the Portland Metro or Eugene areas. PRINEVILLE, OR -- The Prineville-Crook County Chamber of Commerce will host a forum Tuesday evening, with the seven candidates for County Commissioner, Position One. Candidate Peter Sharp says it’s an opportunity for voters to get to know each candidate. "To me, I think it’s very important. And, I sometimes get frustrated that we can’t get out more to get people more involved. Because, I really want the people out to look at all of us." Melanie Marlow says it’s important voters learn about what makes each candidate different. "I’m a small business owner, we need more of the same. We need to diversify Prineville/Crook County’s economy. And, I believe the way to do that is to start utilizing what you already have." Retired Prineville Public Works Director Jerry Brummer tells KBND News his top priority is getting a new jail. "We haven’t had a decent jail facility in a number of years. They tried to pass a levy 10 or 12 years ago and wasn’t successful, and the jail has really deteriorated. We’ve been renting rooms from Jefferson County for a number of years and I just feel that we need to take care of our own." Sharp, Marlow and Brummer are running against Shelby Duncan, Tom Jay, Jodie Fleck and Jason Carr for the nonpartisan position. If no candidate receives more than 50% of the vote in the May 17 primary, the top two will face off in the November election. Tuesday's forum begins at 6:30 p.m. at Carey Foster Hall, inside the Crook County Fairgrounds. BEND, OR -- Commercial vacancy rates dropped to near-record lows in Bend in the first quarter of 2016. 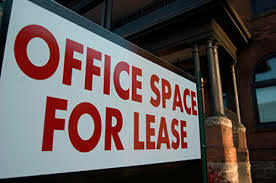 Pat Kesgard, with Compass Commercial Real Estate, says office vacancies dropped another half a percent, to 6.3%. "What that means in square feet, is about 19 – almost 20,000 square-feet of office that was absorbed in that quarter." He says the tightening market will cause lease rates to rise in the coming year, assuming things like interest rates and future growth continue as expected. 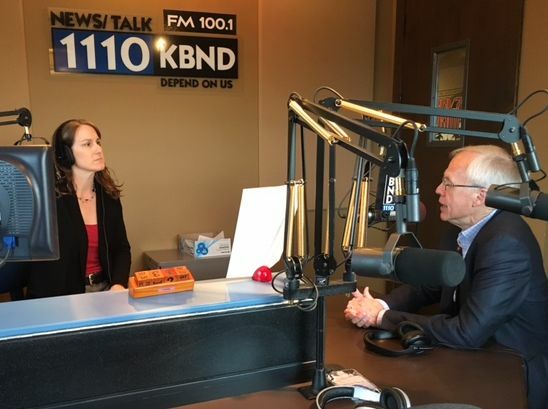 Kesgard tells KBND News, "When we talk about that vacancy, 6.3%, the majority of that is going to be along Third Street corridor in Bend – about 12% vacancy in that area." But, he also says redevelopment along Third Street is likely to tighten that area, as well. "Perfect example of a retail development is where the Platypus Pub is, that and two adjacent buildings, was recently sold and that will be totally redeveloped. So, you’re going to see that retail development, and some of those older buildings go away." Retail availability also dropped a half a percent, to 4.7% in the first quarter. And, the Industrial vacancy rate fell nearly three-percent to 3.4%. Kesgard says that lack of availability is forcing many companies to Prineville and Redmond. "What is so interesting about Redmond, there is so much industrial land, and so many finished lots that are ready to be built on, that’s going to be a lot of where the industrial tenants are going to go." Redmond’s industrial vacancy rate fell from 5.4% to 4.8%, in the first quarter. To hear our full conversation with Pat Kesgard, click HERE or visit our Podcast Page. PRINEVILLE, OR -- Crook County authorities believe they know who has been knocking down and destroying campaign signs in the Prineville area. 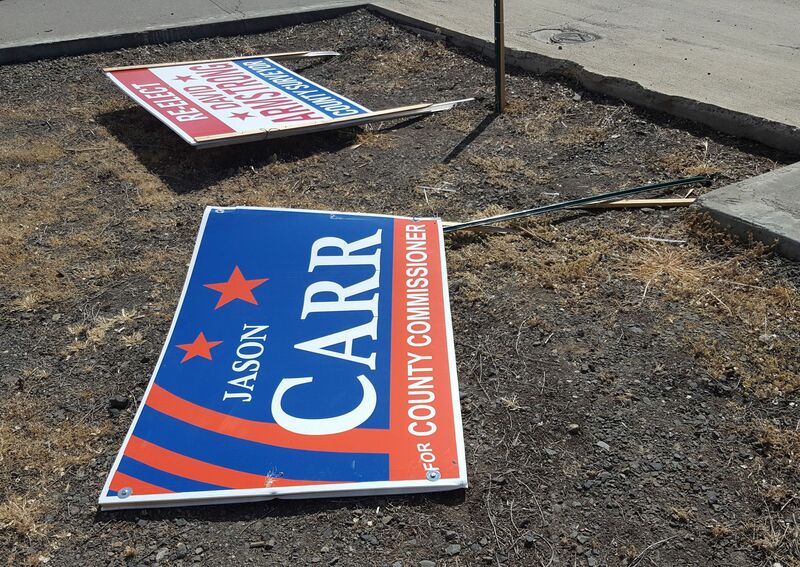 County Commissioner candidate Jason Carr had several of his signs damaged, and some were taken. "There were about a dozen or so small yard signs that were stolen, and they haven't been able to determine who took those," Carr tells KBND News. "But, what they did find out, was that there was a particular person who didn't like a larger sign and where it was located at Third and Locust." The man was told to contact the candidate or authorities if he has problems with where a sign is, and not to remove it himself. Carr says he won't press charges, and the man does not appear related to a specific campaign. "I think this was just a guy who, unfortunately, took it upon himself to try to knock down and remove a sign without getting in touch with me or somebody else to say, 'hey, is there a possibility this could be moved, I don't like it there. It's blocking my vision.'" He admits many are suffering from sign fatigue but says the primary will be over in less than two weeks. BEND, OR -- Deschutes County Commissioners heard four hours of public opinion Monday, on whether to allow recreational marijuana grow operations in rural areas. People packed the hearing room for a chance to share their thoughts, and passionate pleas were heard on both sides of the issue. Leila Carter, of Bend, told Commissioners many have a negative impression of those in the marijuana industry, but she says that hasn't been her experience. "The last time I checked, I couldn't pick my neighbors. Whether it's NorthWest Crossing or rural Deschutes County, I couldn't pick their profession or how many animals they had, or how many parties they chose to throw, what kind of car they drove, or the color of their skin; or, if they were going to be good and reasonable neighbors. The only control I have is myself." Read more about a recent survey, paid for by the industry, showing support for allowing rural pot grows. Kevin Hogan, co-owner of local cannabis company OreGrown, also asked the board to end the ban. "The very notion of a 'do over' vote silences the vote of your constituents, is anti American. They're counting on you to opt in, implement and let their voice be heard. Furthermore, by opting out, you're placing unwarranted stress on small business, the backbone of America. For the local cannabis industry, the short-term effects of the opt out are felt daily; and the long-term effects, and our worst-case scenario, will be disastrous. There will be layoffs in all cases." But, many rural property owners, like Tumalo resident Carrie Deetin, spoke in favor of sending the issue back to voters. "The decision before you today, is momentous to the future of Bend. In some fashion, it will effect every man, woman and child who lives in this county. To date, many hours have been spent by dedicated citizens searching for a middle ground, to no avail. The disparity and discord is as strong and wide as ever. I respectfully request that you, the County Commissioners, put this decision back in the hands of the people of this county." Read more about a grassroots effort to continue the "opt out." And others, like Robert Pederson, talked about how grow operations could impact quality of life in rural parts of Deschutes County. "Why allow an industry here, with water, electricity, odor and unsightly plastic greenhouse issues? Stunning scenery and outdoor recreation have always been magnets for tourists and residents, alike. Why spoil that lifestyle and undermine the investment of property owners? Those threats will increase dramatically with more than one license per parcel." County Commissioners expect to begin deliberating Wednesday. They'll decide whether to continue the temporary ban on rural grow operations and send the issue to voters in November, or opt in and impose regulations on the industry. 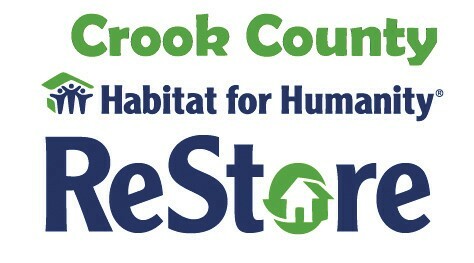 PRINEVILLE, OR -- Habitat for Humanity in Crook County is shutting down operations, and the ReStore in Prineville will close June 30. 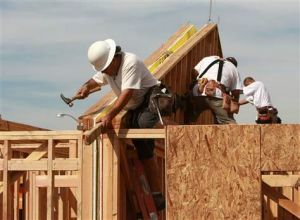 Bend Habitat merged with Crook County in 2008 to help build more affordable housing in the region. Robin Cooper-Engle, with Habitat, says it was not an easy decision. "It's been a challenge, financially. We've put money into the community to help further the mission of Habitat, and it's just not moving forward like we had hoped." She tells KBND News, "So many of us put lots of heart and soul into the time there. We've been trying to move things forward over this last year to see if things would change a little bit. And, unfortunately, this is a decision our board made that it's time to close operations." She says rising costs of land and construction contributed to the economic problems. Cooper-Engle says over the last eight years, Habitat has invested $275,000 to help the Prineville community. They've served five families and completed 40 home repairs. 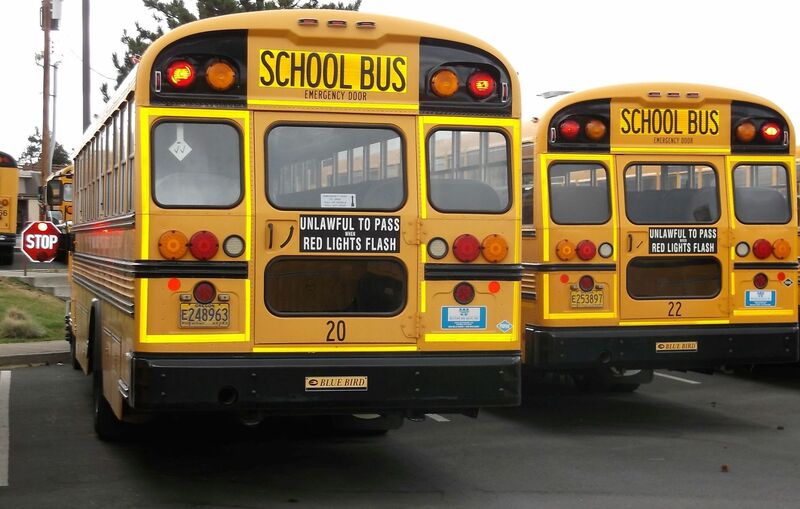 BEND, OR -- It could be the negative side of Deschutes County’s record low unemployment – the Bend-La Pine School District is struggling to hire enough bus drivers. Transportation Director Denice Blake tells KBND News it’s been difficult to recruit qualified applicants. "The need for school bus drivers is nationwide. Anywhere I travel, we see signs up for school bus drivers; our trade journals are always commenting on recruiting, and hiring, etc." She says many don’t realize how flexible the job is. Local recruitment efforts are targeted to stay-at-home parents and retirees. "We have the holidays off, we have two weeks at Christmas, and we have all summer. So, you can be retired, work part-time, get involved in the community, meet new people, be involved with children; and yet, you still have the time to go and relax and play." The district provides all necessary training. "We have a complete training team. We can take people that, if you have a drivers license, you have a good driving record, you can pass a criminal background and pre-employment drug/alcohol screening, we can train you from ground zero to having a complete commercial drivers license," says Blake. Pay starts at $11 an hour during training, then goes up to $13.50 for substitute drivers. Regular drivers are paid $16.07 to $23.33 per hour, plus benefits. Learn more about the open positions, HERE. Interested candidates can attend an open house at the "bus barn" at 501 SE Second Street in Bend, May 21. For details on the open house, call 541-355-5700. 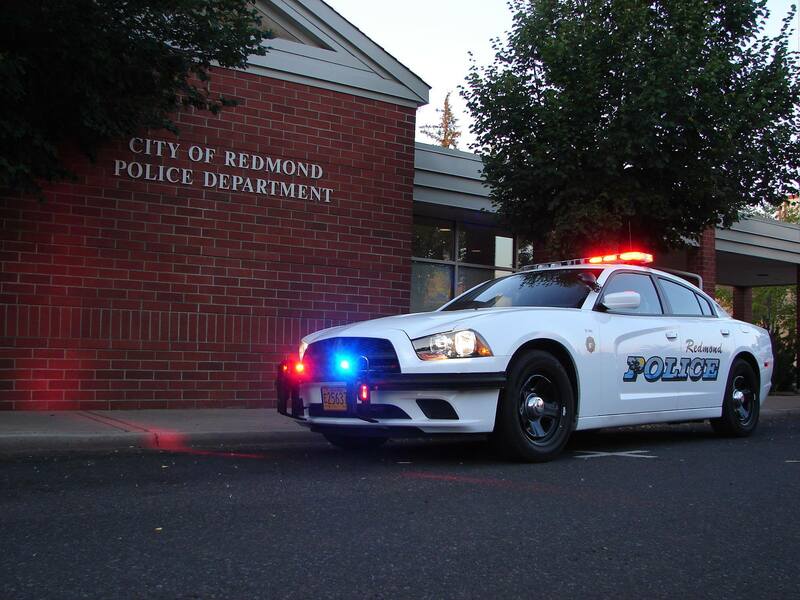 REDMOND, OR -- Redmond Police helped save a boy after he jumped into the canal to escape capture, Sunday night. 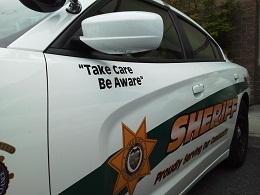 The juvenile was a runaway from Rimrock Trails Adolescent Treatment Center in Prineville. When fficers located him along SW Canal Blvd, he ran from police and jumped into the canal. In an effort to prevent the boy from going down the spillway, officers, with help from the Deschutes County Sheriff’s Office, performed an impromptu water rescue. The juvenile fought one officer trying to get him out of the water, and other officers were able to assist in pulling him out. He faces several charges including, escape, resisting arrest and interfering with a peace officer. 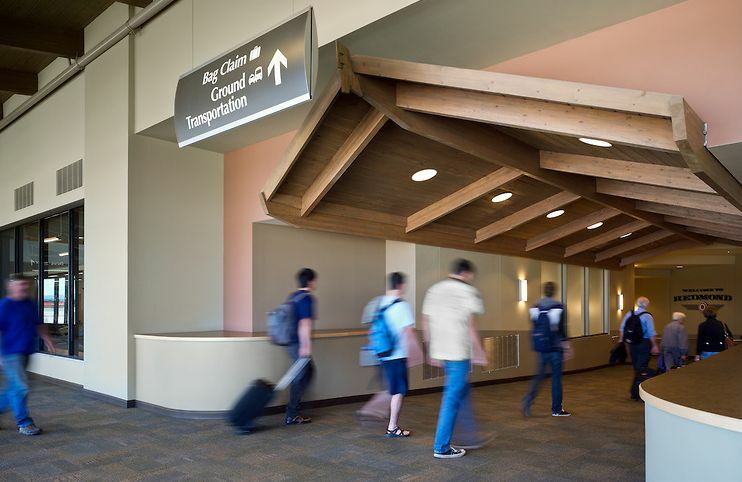 REDMOND, OR -- Redmond Airport is closed to commercial flights for three weeks, beginning Monday, as crews continue a $20 million runway paving project. But, Roberts Field Security Director Nicole Jurgensen says the airport won’t sit idle. Multiple law enforcement and fire agencies will take part this week in "active threat" trainings, "To make use of this unique time we have. Most airports aren’t able to support a full-on training exercise. We’re still open, but there won’t be very many people here, with the air carriers not being active, so it’s a great opportunity," Jurgensen tells KBND News. She adds, "This will be the best realistic training that we’ll be able to experience with the law enforcement. They’re going to use their training weapons, which are safe, of course. But, it will sound like real gunfire, so that does create a realistic element to it." The Transportation Safety Administration will also conduct "Run, Hide, Fight" training for civilians. Jurgensen says, "The TSA law enforcement officer from Portland is coming to do training with civilians that will be then be role-players for the scenario." The various groups will then work together in a number of scenarios throughout the week. Visitors will see emergency vehicles at the airport, and could hear realistic gunfire during the exercises. Flights are expected to resume at the airport in three weeks. BEND, OR -- Bend Police participated in the first statewide job fair hosted by the Department of Public Safety Standards and Training (DPSST), over the weekend in Salem. Chief Jim Porter tells KBND News Bend is just part of a nationwide officer shortage. "We have been facing a shortage of officers for the last 24 months. Presently, we have three officers in the academy, we have five officers in various stages of field training and we have six openings, potentially seven openings by the end of the month, that we’re trying to fill." More than four-dozen city, county, state, tribal, university and federal agencies took part in the two-day job fair. DPSST says those agencies need to hire more than 500 employees to fill both sworn and non-sworn positions, statewide. Chief Porter cites a number of reasons for his department's vacancies. In Bend, typical retirements by long-time officers are now coupled with younger cops changing careers early. He says that's because the job is harder than it used to be. "We’re seeing our officers facing challenges they’ve never had to face in their career before. One officer, just this last week, he covered five completed suicides, three of them with firearms, in a one-week period in Bend. That is a lot, a lot of trauma for one person to carry with them." He says negative publicity surrounding law enforcement in other parts of the country is also pushing some to choose not to go into the field. But, in Bend, there's another big hindrance to recruiting: the region's tight housing market. "We find very good officers, we actively recruit them, and then they say, ‘sorry Chief, we’ve looked it over and looked at houses.’ One of them actually spent an entire week in Bend, looking for a house, spent time downtown talking to people to see what kind of police department we were to see if he wanted to join us. And then he came back and said, ‘after a week, Chief, I could not find someplace that I could put my family in, that I feel comfortable renting.’"
So, BPD is trying to entice potential officers with an attractive recruiting package, including help with moving expenses. "Presently, for a lateral police officer – that means an officer that’s already certified and can work in the state of Oregon – we’re offering a $6,000 signing bonus. We’re also offering, in addition to that, a week’s worth of sick leave once they’re here, and a week’s worth of vacation. So, even with those high number of incentives, what I’m hearing directly from two officers we actively recruited – both of them called me back and said, ‘Chief, I’m sorry. I’ve looked it over, I cannot afford to buy a house in Bend and maintain the lifestyle where I presently am.’"
SISTERS, OR -- The Sisters City Council is already working to hire a new City Manager, following last week's resignation of Andrew Gorayeb. The former City Manager had been on paid administrative leave due to employee complaints, prior to submitting his resignation at Thursday night's City Council meeting. Officials have refused to elaborate on the nature of those complaints because of an agreement with Gorayeb. City Councilor David Asson tells KBND News accepting his resignation and paying a severance package seemed the lesser of two evils, since it was possible Gorayeb would sue the city. "Given the complexities of HR law and codes, and so on, different councilors had different perspectives on it. I think that we ended up providing an excessive severance package; others contend it was the proper thing to do in order to avoid more complications." Gorayeb could have gotten his job back, but he refused to accept terms that included a probation period, evaluations and management training. Instead, he will receive 12-months of pay and benefits worth more than $100,000. Asson says they are now moving forward with hiring Gorayeb's replacement. "We're going to hurriedly interview new applicants for a permanent City Manager. We hope to even start interviewing as early as [this] week. We know that there are several qualified people who are willing to apply and we are contacting them." He admits they've had trouble with the last two City Managers, but he says they've already heard from interested candidates. "From what I've gathered, these people have approached us. So, I guess Sisters is still a very dynamic place and people want to come here. That has been a question, it has been a worry. But, from what I can tell, at least three are very interested." Councilors hope to have a permanent person hired within the month. A complete schedule of summer activities is on the Bend Parks and Recreation District website. 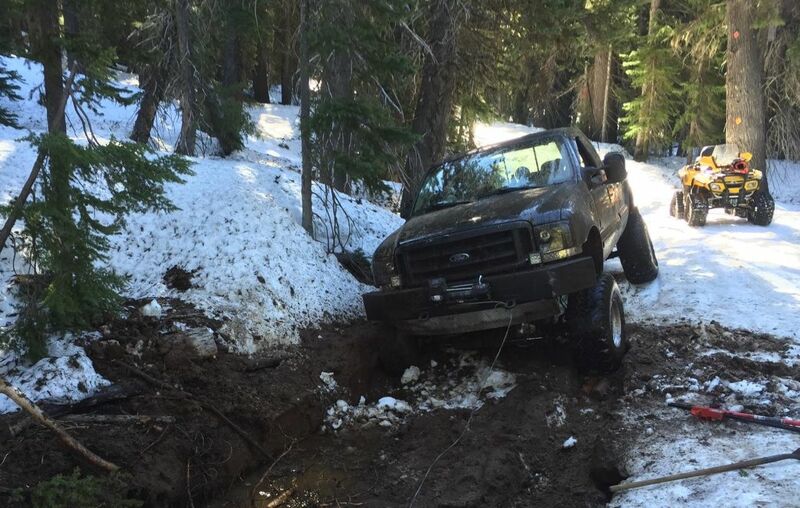 BEND, OR -- Three men had to be rescued from near Skyliners Road, after their pickup got stuck in the snow in a closed area, over the weekend. The driver, 30-year-old Timothy Price of Bend, and his passengers, 38-year-old Jason Johnson and 28-year-old Ronn Wilson, called for help early Sunday morning due to the distance they would need to walk in the snow. They had fuel to stay warm and agreed to wait for daylight. It took Deschutes County Search and Rescue more than two hours to reach the trio on Forest Service Road 370, after traveling seven miles through the snow on tracked quads. A follow up investigation is expected by the Forest Service.